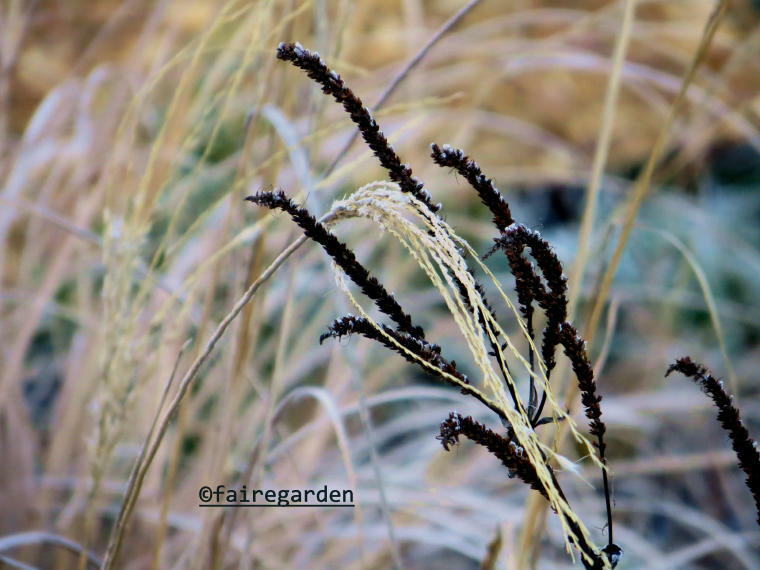 Late fall is sliding into winter rapidly here in the Fairegarden. 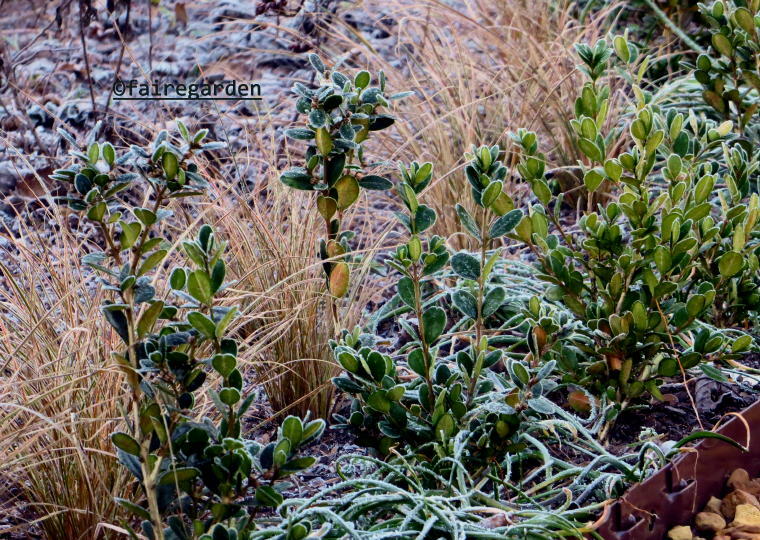 Several frosts have occurred, speeding up the process of decay. 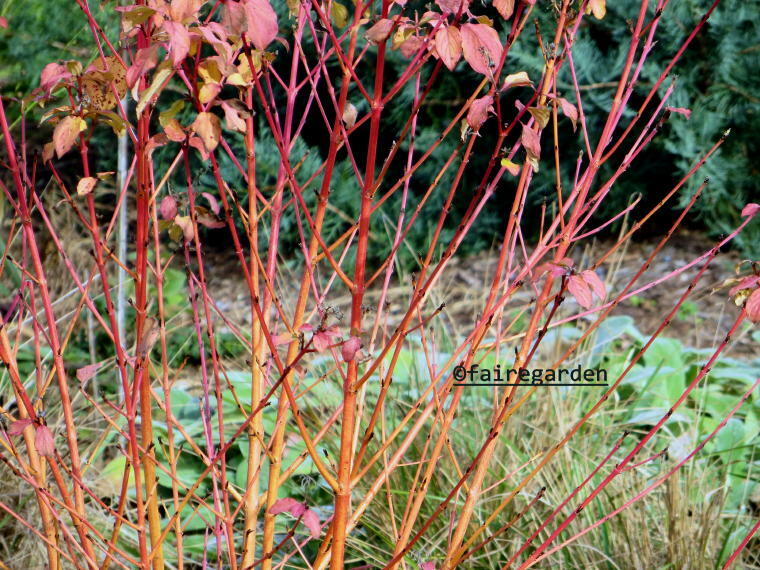 Ever experimenting, in all pursuits but especially in the garden, we watch as colors fade, leaves release and fall to the ground, and stems stand bare. 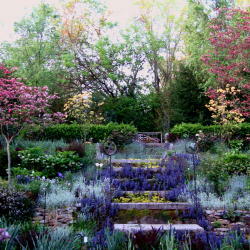 What is still attractive, how long will it remain so, how can we tweak the plantings for optimum viewing pleasure? In past years, the brown bobble seed heads of Eryngium yuccifolium have collapsed rather quickly on weak stems. 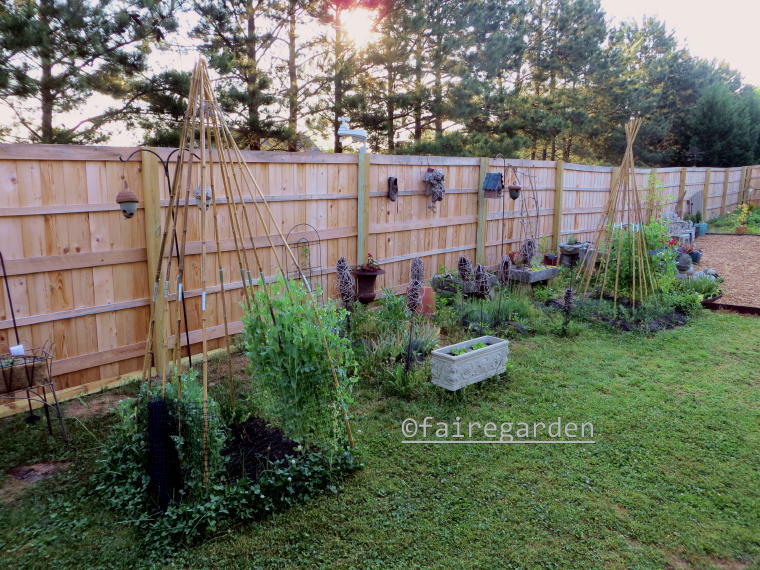 This year, bamboo stakes were added as the stems began to lean and list. It was a task that has paid off, we think. 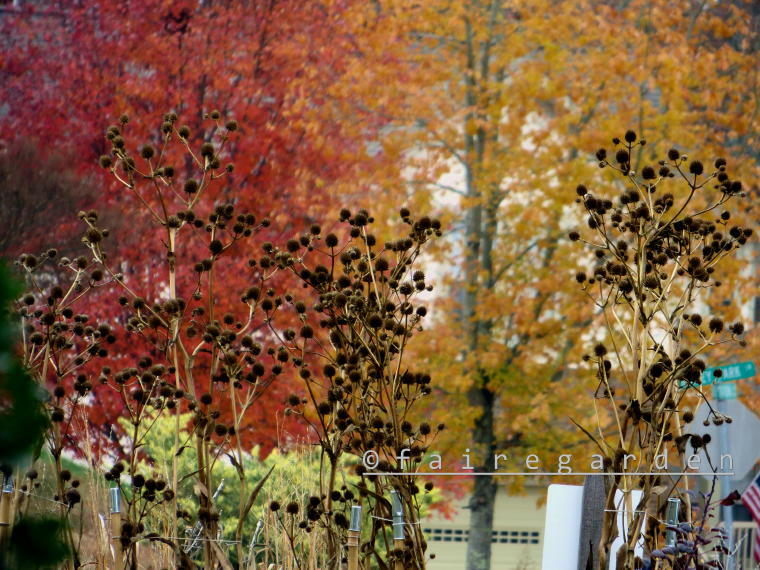 Borrowed splashes of color make for a sweet background while the leaves still remain on the distant maples. The view from the front porch has been carefully curated to offer consistent interest in all seasons. 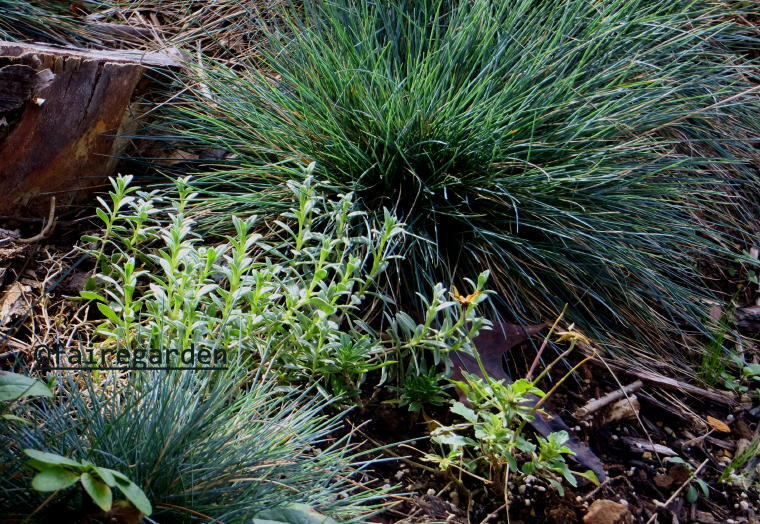 Evergreen perennials such as silvery Dianthus, Santolina chamaecyparissus, and lamb’s ear are punctuated with grasses blue fescue, Festuca glauca and Stipa tenuissima. It was noticed that the upright Veronicas last well into winter here in USDA Zone 7a. 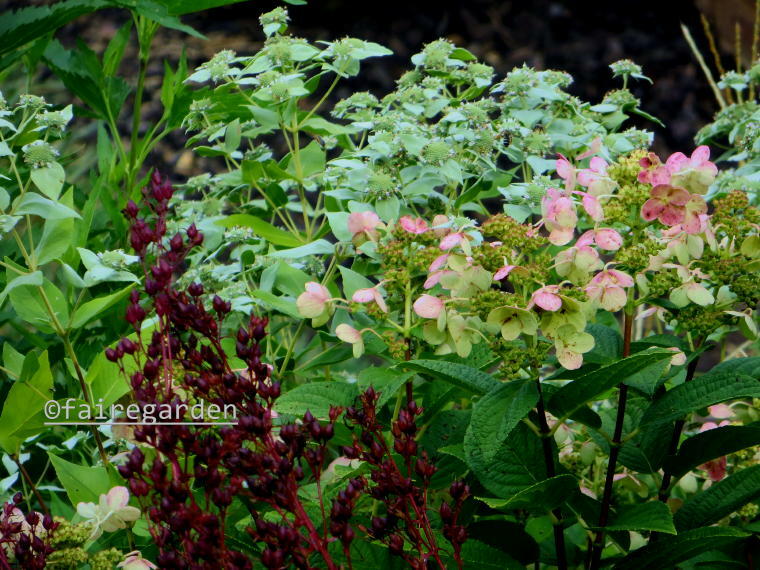 V. ‘Sunny Border Blue’ is the tallest and most robust, seen on the right side in the above image. The spent flower stalks are like fuzzy rat tails. 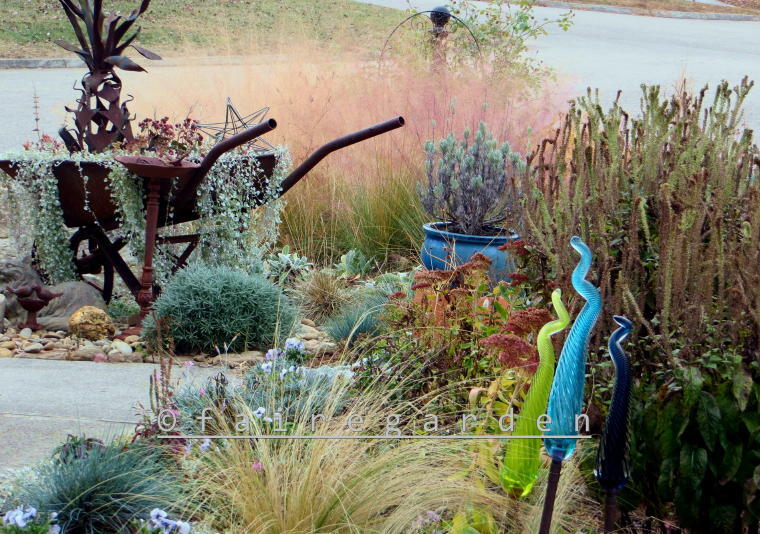 Rusty metal, glass sculptures and various rocks add textural interest. 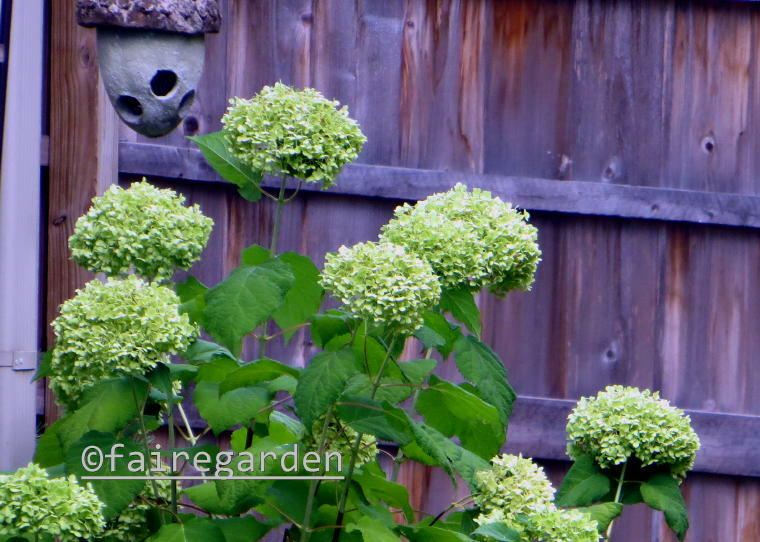 Going around to the back gardens, we see the brown is also a color Hydrangea arborescens ‘Annabelle’ heads proudly persisting. The two hundred foot long cedar fence is fading nicely, two years after installation. This angle suggests there are a lot of artsy objects hanging on the fence. This angle is not wrong. 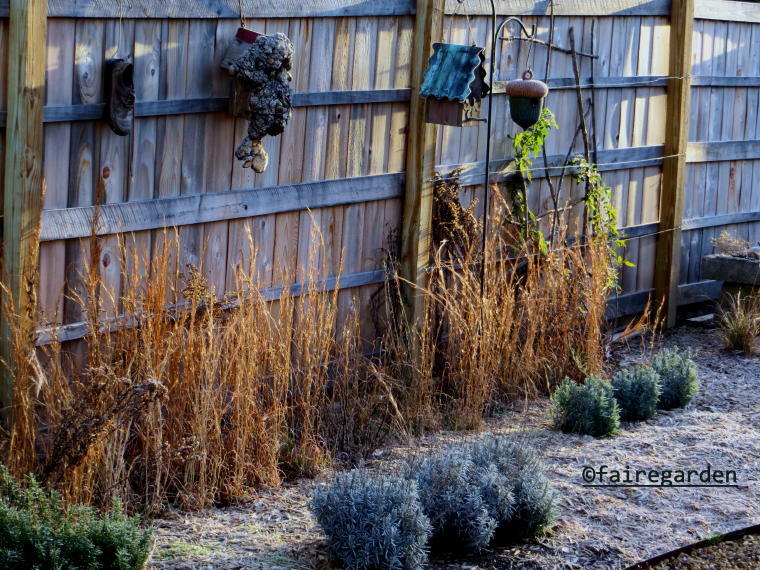 Yarrow, Salvia and Scabiosa flowers linger, protected from the cold by the sunny south facing exposure. 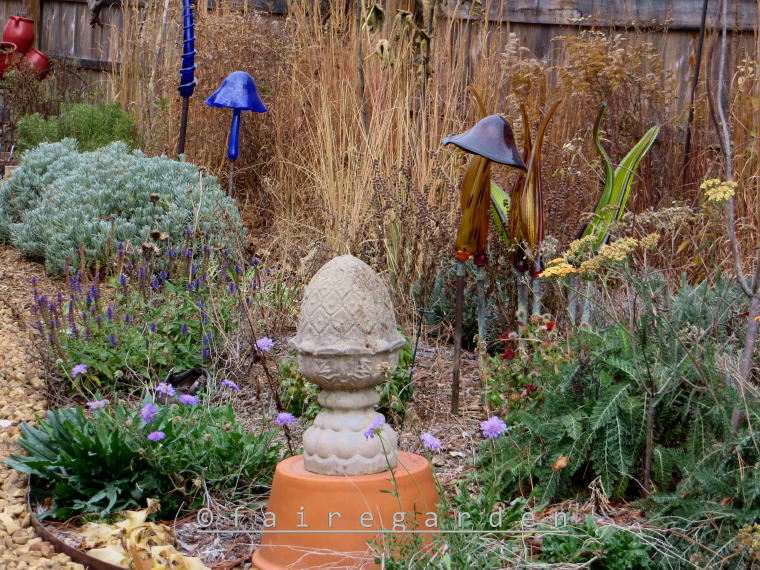 Lavender mounds, glass garden art and naturally occurring wildflowers along the fence line are anchored by the concrete pineapple sitting on the clay pot pedestal. There has been growth in all the beds since last year. Check out this post from last winter to see the progress. From the opposite vantage point we can see the rosemary mounds, sunken bog plant garden, native carex and violas spilling from a broken glazed container. 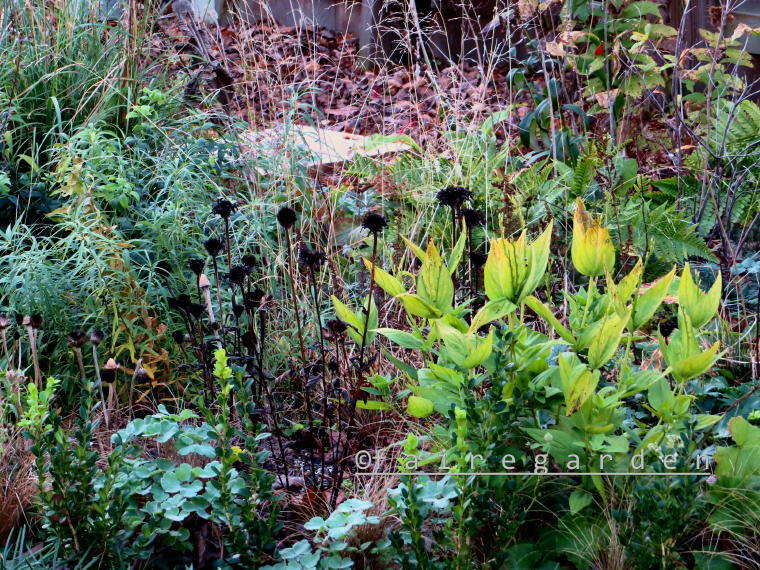 Some of the hardiest and most attractive of the plants growing here could be considered weeds. Allowing the lawn to grow undisturbed revealed the delightful broom sedge grass, Andropogon virginicus as a dominant player. I believe the other plant is a Euphorbia of some sort. Zooming out a bit, I cannot hide the fact that too many containers, too much art and decor was brought in the move from the old garden. I left a lot behind, honest! It keeps getting moved around as beds are designed and redesigned until the placement seems right. A work in progress. The evergreens are Chamaecyparis ‘Red Star’ that were stuck in the larger square pots until I could figure out how to best use them. There they remain. 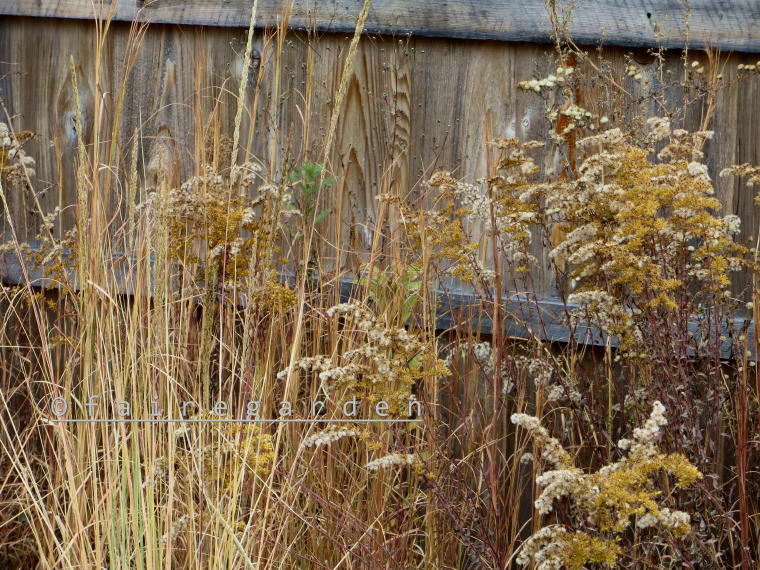 Joining the broom sedge is a goldenrod that has won my heart. I am still trying to identify it. The various asters that sprung up are simply asters, mostly white flowered. Identification is futile. Each year has been different since we moved here in August of 2014. There have been flooding rains, extreme drought, colder than normal winters with snow and ice storms, warm winters with scant precipitation, strong, gusty winds and everything in between. This year the foliage of the Siberian iris and daylilies has been brilliant. The greens and golds add artistic touches to the toasty tans. There are few pursuits as ever changing as gardening. Thank goodness. And…onward. 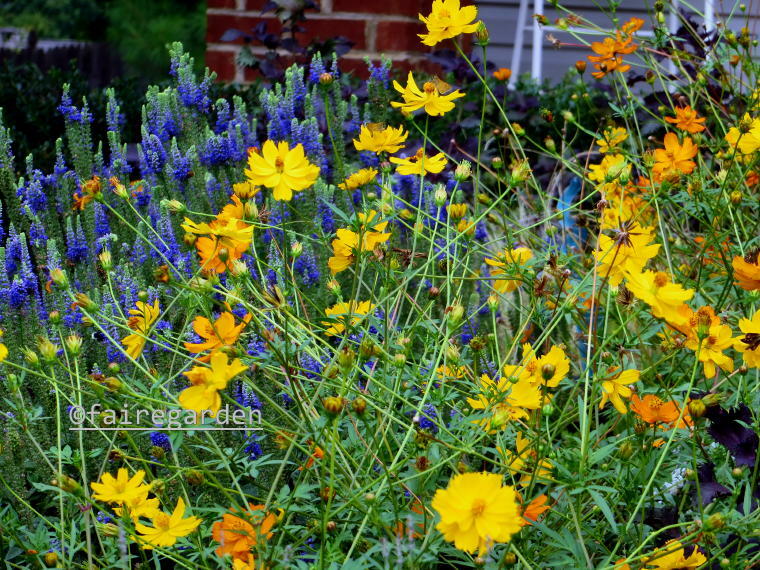 My gardens have always been a mix of natives and non-natives. I have found it best to go with what will grow and try to make it into a pleasing design of some sort. 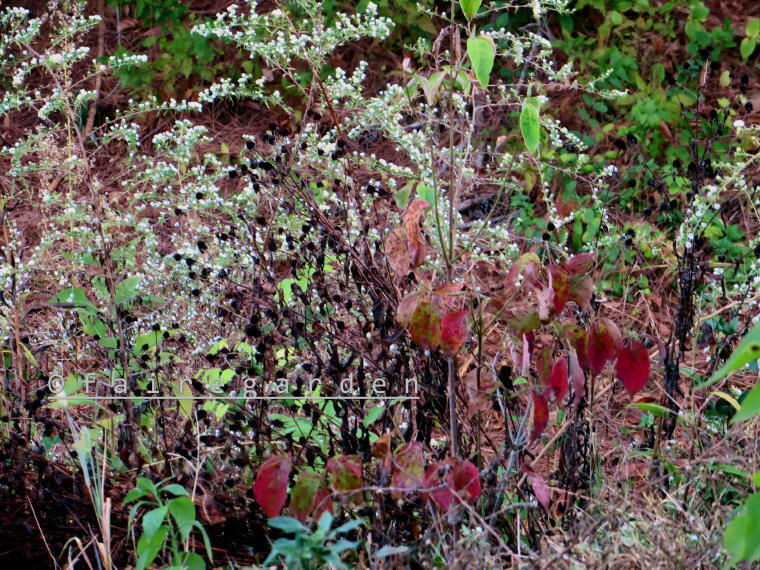 Fall in east Tennessee is when the roadsides, fields and meadows explode in jaunty juxtapositions of color, texture and form. 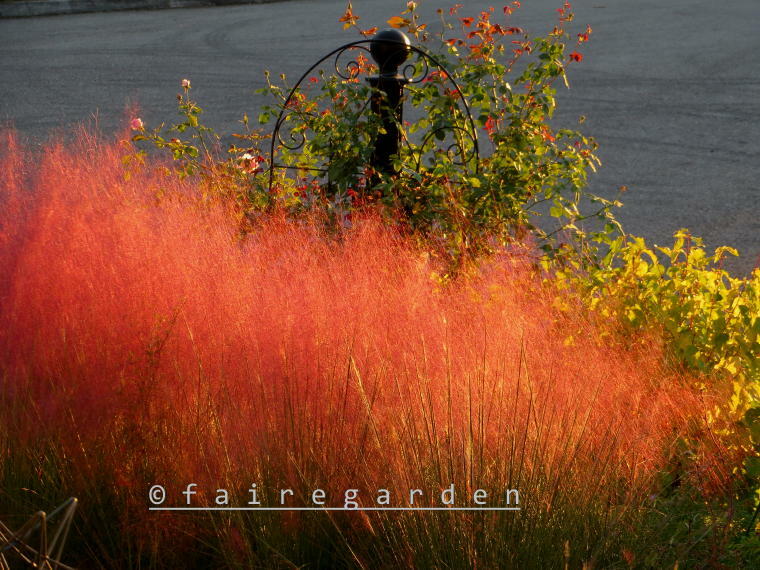 Asters and grasses, among others, join the fall foliage to present quite the grand finale of the growing season. In this new, as of fall of 2014, garden the method to achieve the vision has been to simply allow the former lawn, mostly crabgrass, to grow of its own accord, not mowing at all. The first year the sparse lawn grass grew tall and flowered. There were some wildflowers that sprung up, mostly fleabanes, goldenrods and asters. 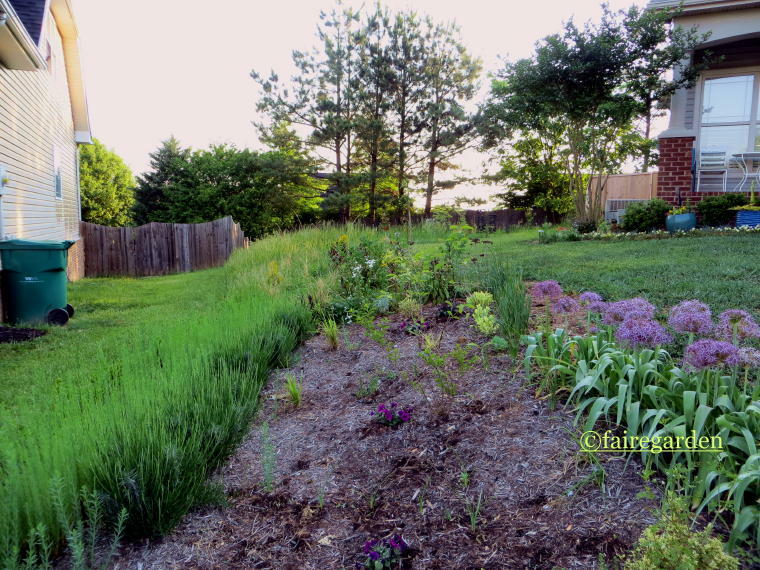 These plants shaded out most of the crabgrass and the front lawn/meadow was born. Unwanteds like the wild blackberries, tree seedlings and large crabgrass looking stuff were dug out. Desirables were and continue to be added, like our beloved dogwoods, Cornus florida, with clumps of lawn grass dug out to make room for the additions. I really find the aesthetics of wildflowers/meadows/natural looking plantings most attractive. Those are also easier to maintain, less labor intensive than formal, rigid designs. 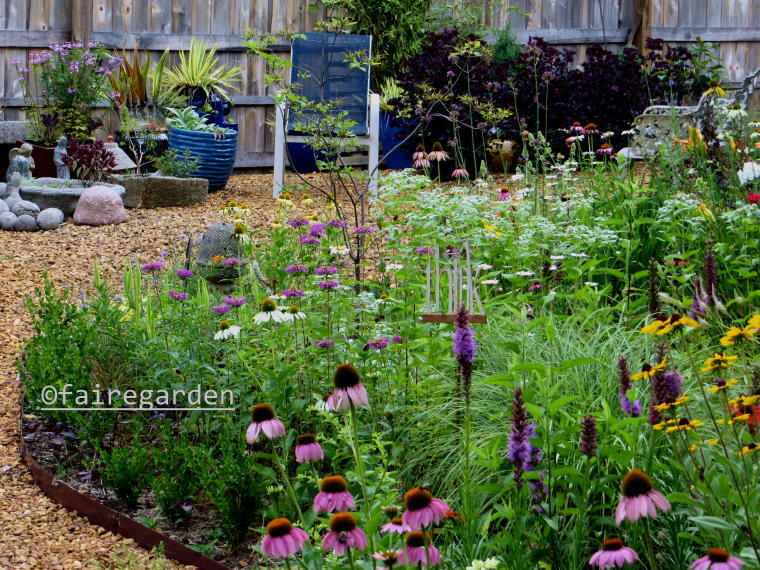 That style is the vision for this new garden. 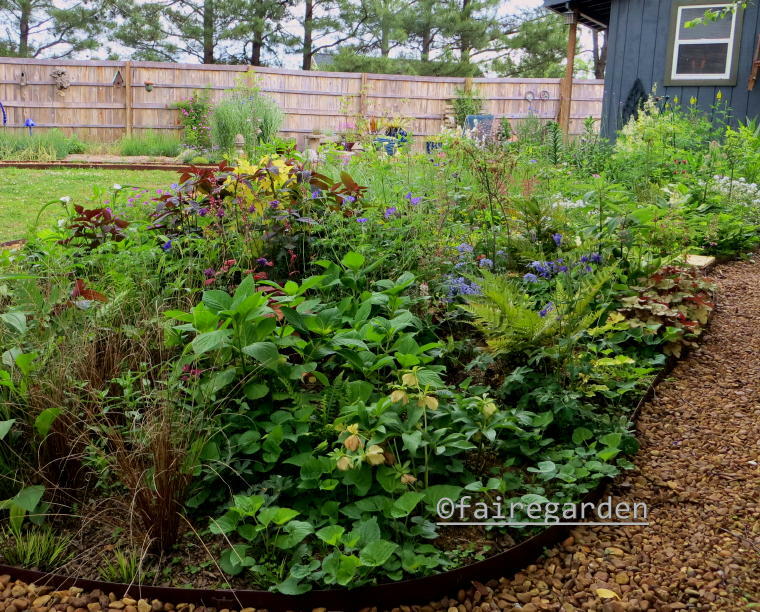 There are still garden beds where I can play, but the majority of this yard is of the relaxed, see what will pop up type. 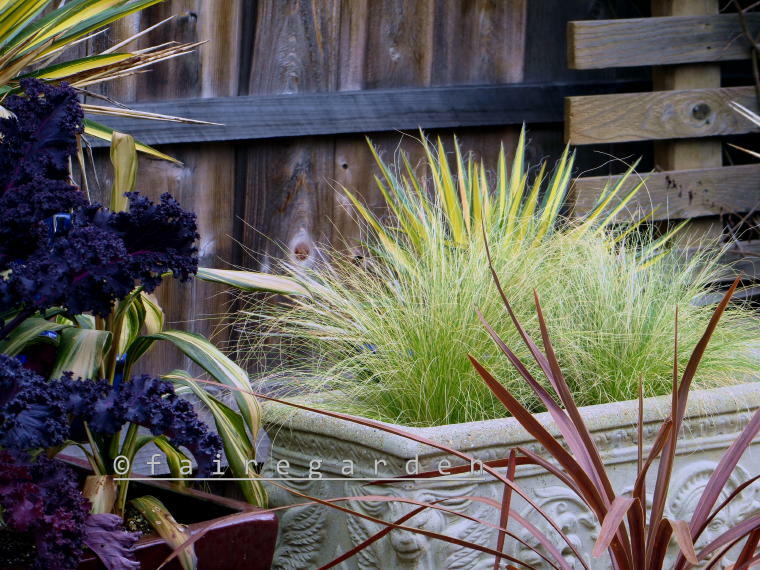 In the back gardens, it was noticed that along the newly replaced wooden fence, a pretty grass was growing. It was identified by my dear friend Gail of Clay and Limestone, whose Wildflower Wednesday meme this post joins, as broom sedge, Andropogon viginicus. I love it, but have to watch out for seedlings all over. There also appeared a relatively shorter Solidago ssp. that is still unidentified. A few tall white asters are allowed for some color contrast. 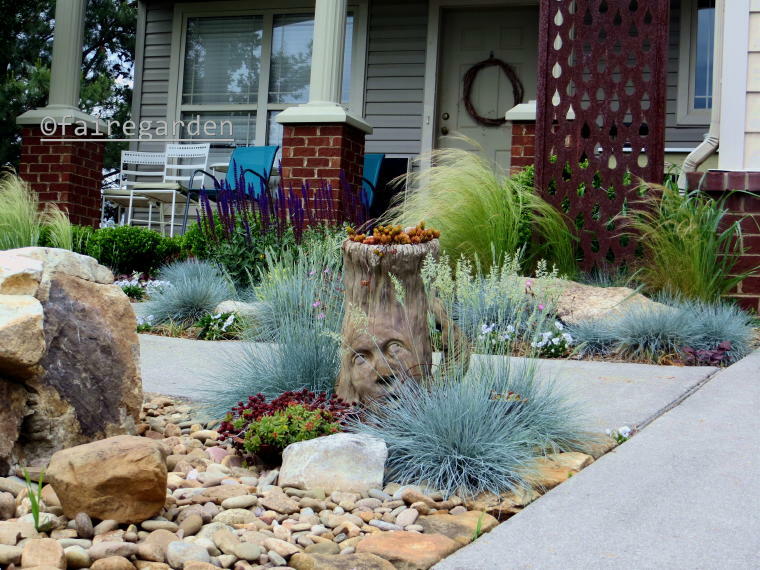 The native grass Muhlenbergia lindheimeri was added and has done well. It will be divided and spread as it grows large enough to do so. 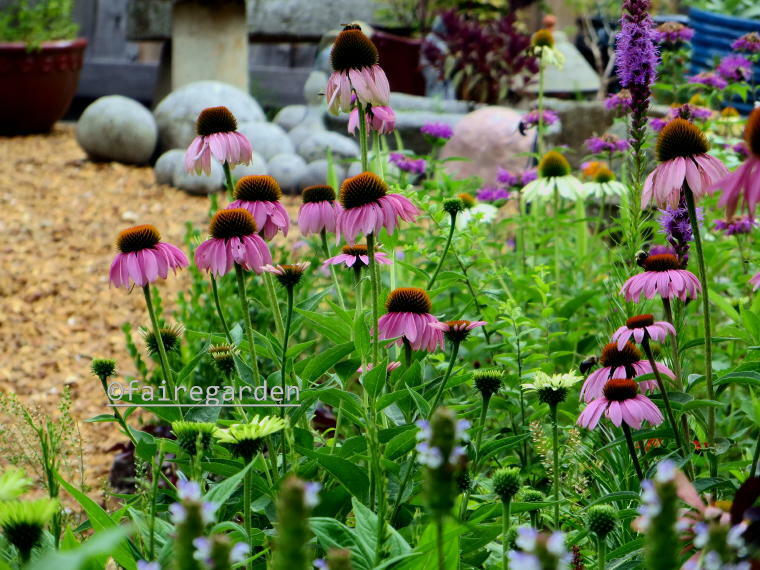 In the two nursery beds in back that were created with yards of imported soil mix dumped and spread about, natives and favorite exotics were added by the hand of the gardener. Spigelia marilandica has grown better than it ever did at the old garden. I didn’t even know it had a lovely golden fall color before now, it had always gone dormant in the dry summer. Gardening is learning. The gardens will continue to evolve, with and without my intervention. Each season of each new year is different. I will wallow joyously in them. I sit in a comfy chair by the window in the living room a good part of the day, gazing down at the laptop. Sometimes, often, I look up to peer through the blinds that are adjusted to allow a small opening for me to see out without the world seeing inside much. 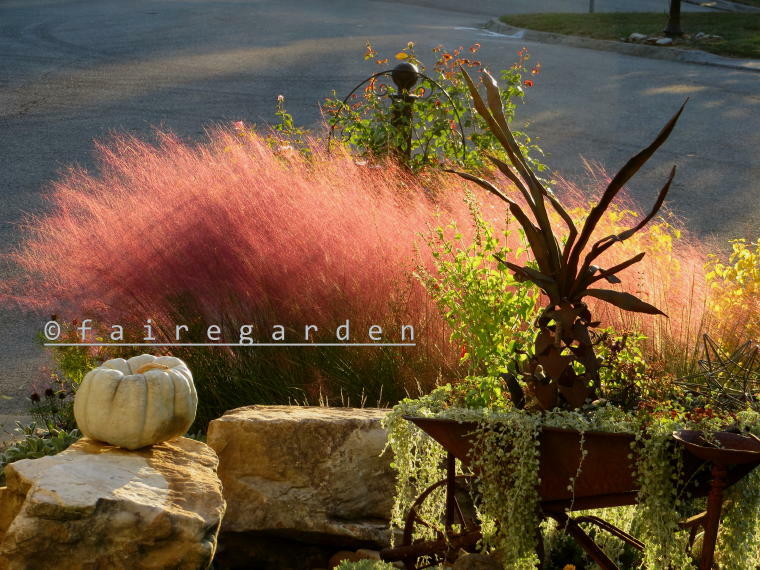 It’s a small slice of garden goodness, especially in October when the pink muhly grass is blooming. 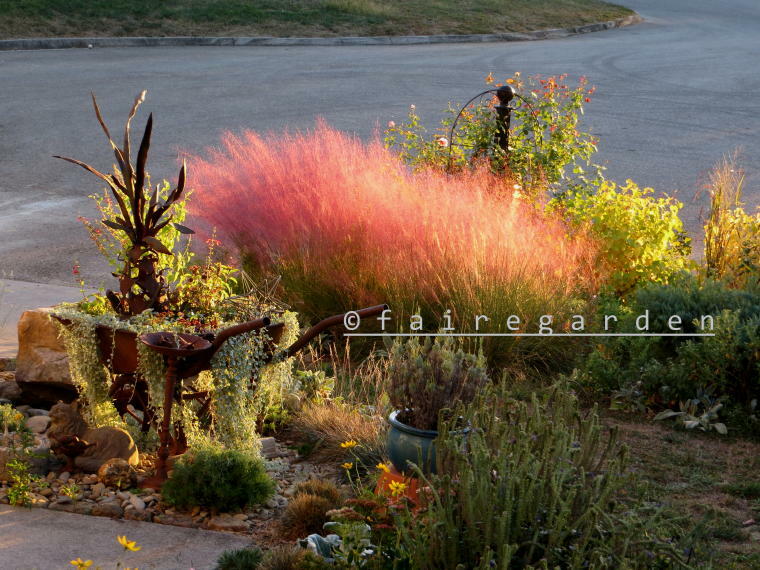 Muhlenbergia capillaris, that is. 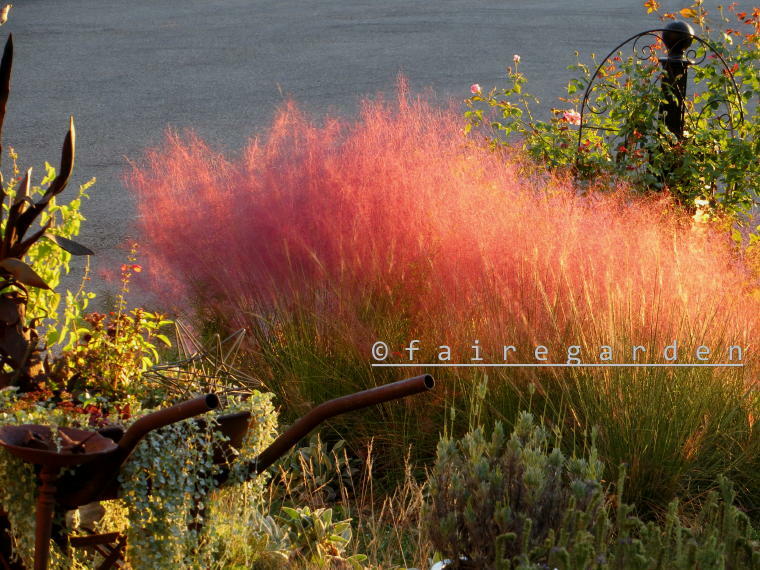 When in full bloom the pink muhly is lovely, a cotton candy confection. 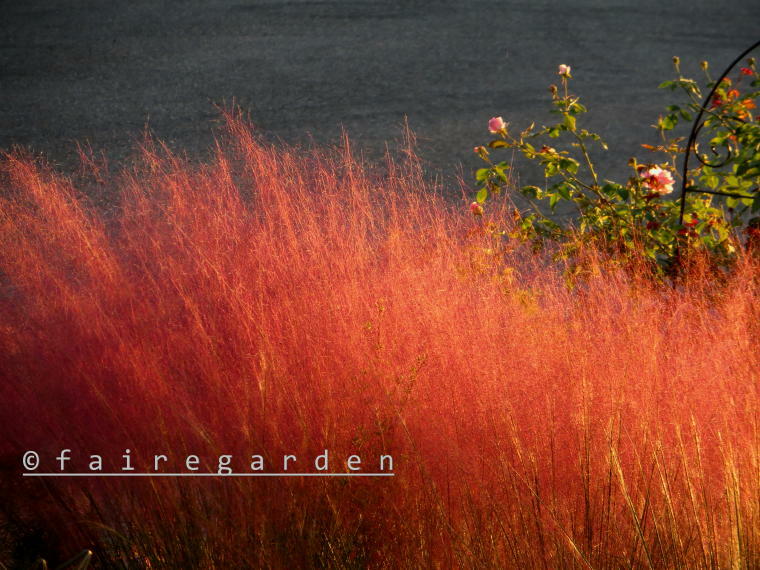 It is unique among grasses for color and fluffiness. 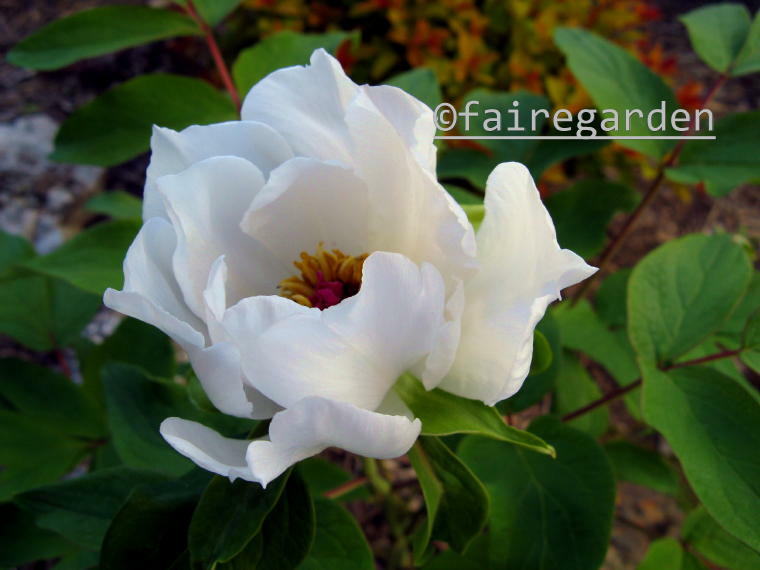 Why it is not growing in every garden where it is hardy is beyond comprehension. I have done my best to bring attention to it through multiple blog posts over the years. It is for sale in my area right now at the big box store that begins with an “L” and ends with an “‘S”. That is where I bought my first plants back in 2000 for the old garden. Those plants were divided ruthlessly to form large, impressive swaths. Seedlings were dug and brought here to the new garden in 2014. They have grown well. 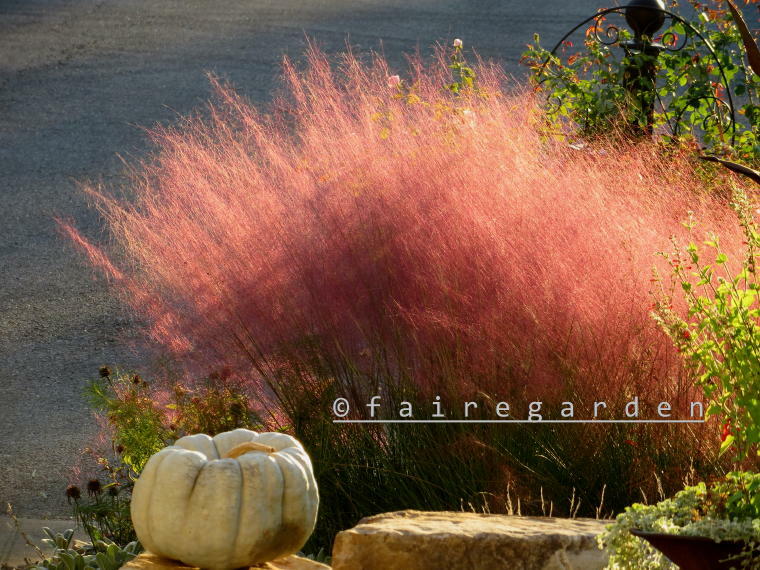 In a full sun down sloping plot behind the mailbox, the muhly holds court in mid October. I like to look at it during the day, but as the sun is setting something special takes place. 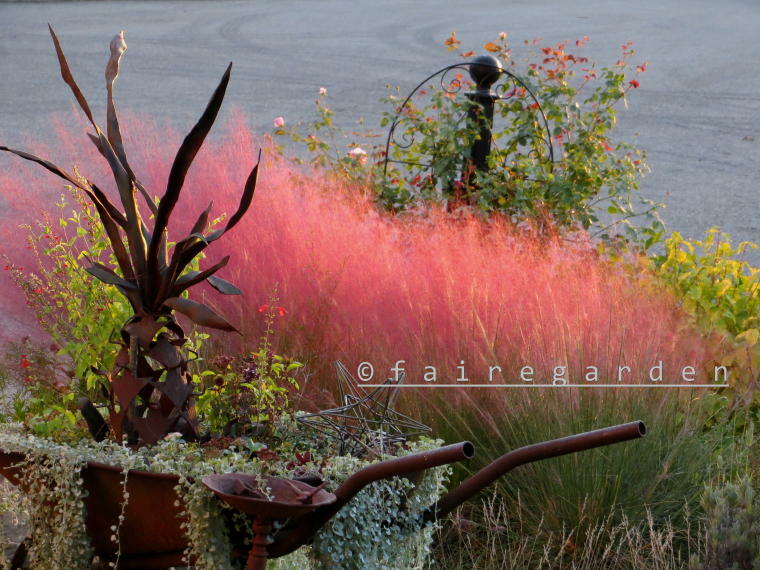 For ten minutes at most, right before 7 PM, the pink muhly transforms from mere plants to brilliant flashing feathers of fiery jewels waving in the breeze. While morning light bestows pink to the landscape, the setting sun paints with a golden brush. I have been waiting and watching this event nightly, wanting to capture the magic to share with you, dear readers. 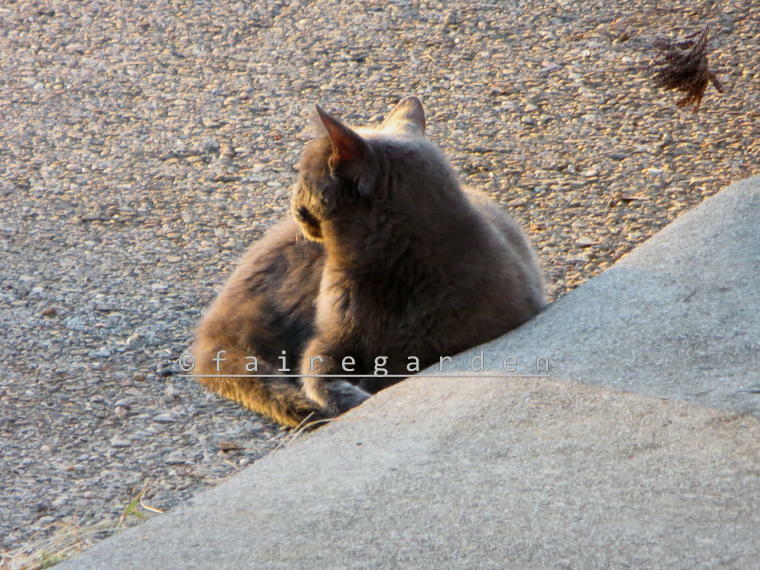 Kitty stands guard from the curb at the driveway edge, also waiting. He likes to watch that evening sun go down. Hey Kitty, get out of the street! 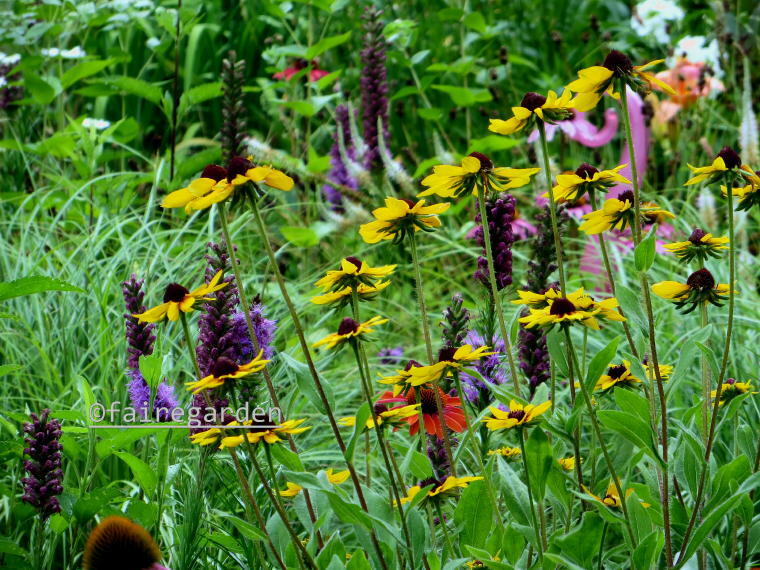 There is a vision for what I desire the garden to be, although it constantly changes, the vision and the garden. It should be peaceful and serene, yet exciting. I want to be filled with anticipation upon stepping outside, but feel a calmness. There is a time for working out there, dressed appropriately and gloved, and a time for sitting and studying what needs to be done to get closer to the vision. Each day is different, never the same as the day, week, month or year before. The vision shape shifts to correspond to the reality of weather and the whims of nature. It is like painting on a moving canvas with colors that blend by themselves before the brush can be applied to the palette. The seasons ebb and flow, causing colors and substance of growing things to weaken. But it’s still beautiful. I still like to look at them. 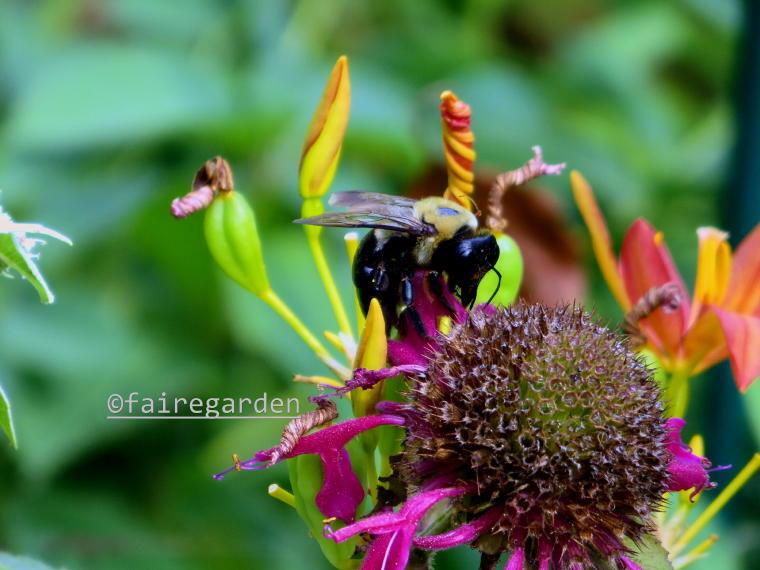 Creatures inhabit a healthy garden. They add movement, breathe life. 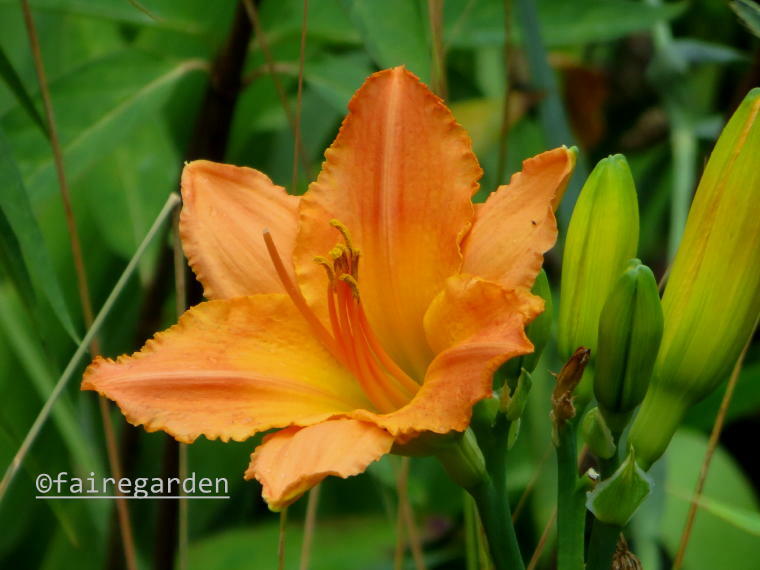 There are surprises, like the Fairegarden bred daylily, Number Twelve, reblooming after being dug, divided and replanted where a spent teasel had taken up space amongst the talls. 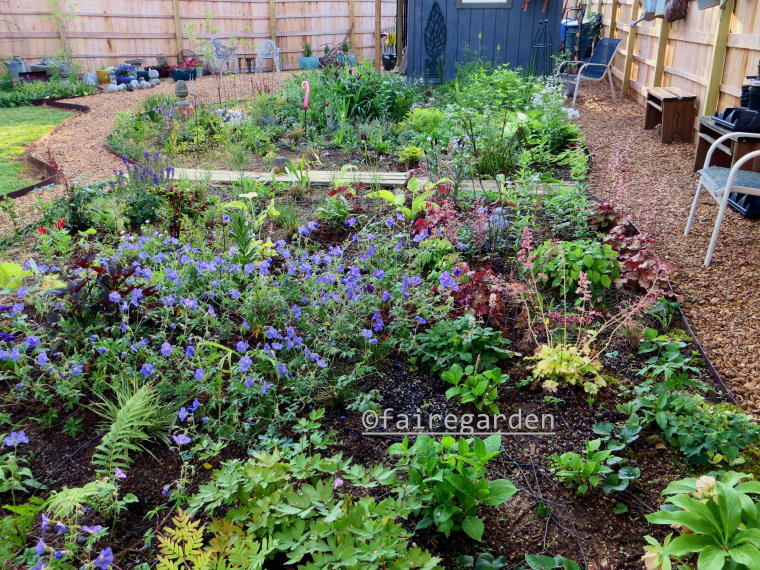 This garden is now two years old and the gardener is growing younger with the prospects of what is to come. Onward. A garden can never be finished. It’s simply cannot, for it is a living thing, constantly changing, hopefully growing, evolving. Just like the gardener. 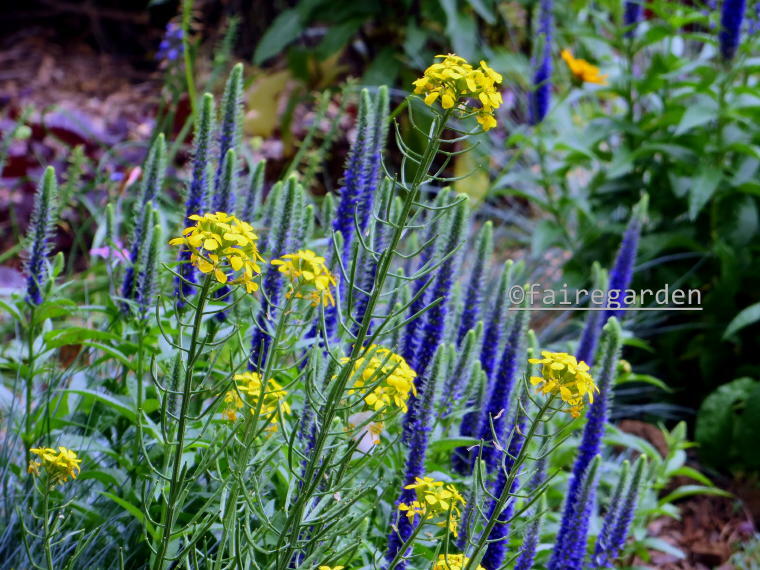 Above: Veronica ‘Royal Candles’ fronted by Erysimum cheiri. Note to self: Save seeds of that wallflower, it’s the only one we have. Evolving right along over a year later from groundbreaking in the crabgrass lawn, progress can be seen. There has been growth as the plantings have settled in, making themselves at home. 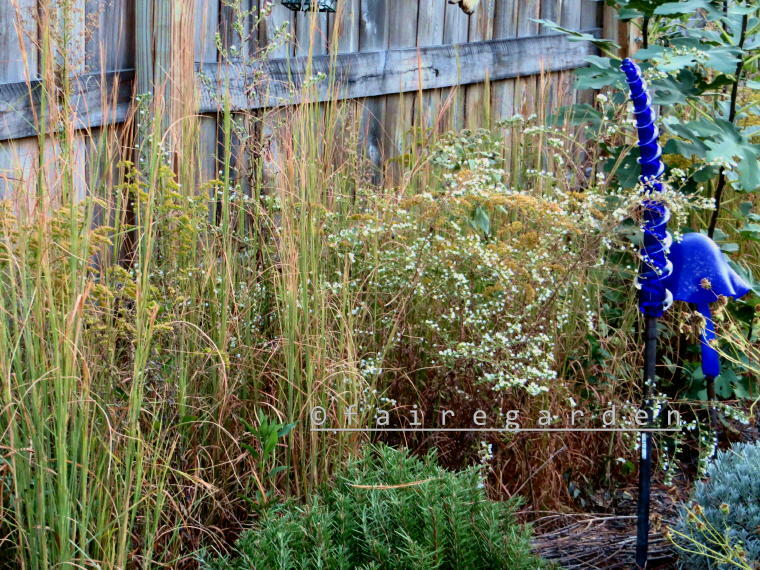 Above: Festuca glauca, Stipa nasella and Salvia ‘Caradonna’ stand out in the front walk planting. The green man in the tree stump approves, even as he seems agitated about that rude squirrel violating his space. The same scene in January, 2015. The street view has also improved. 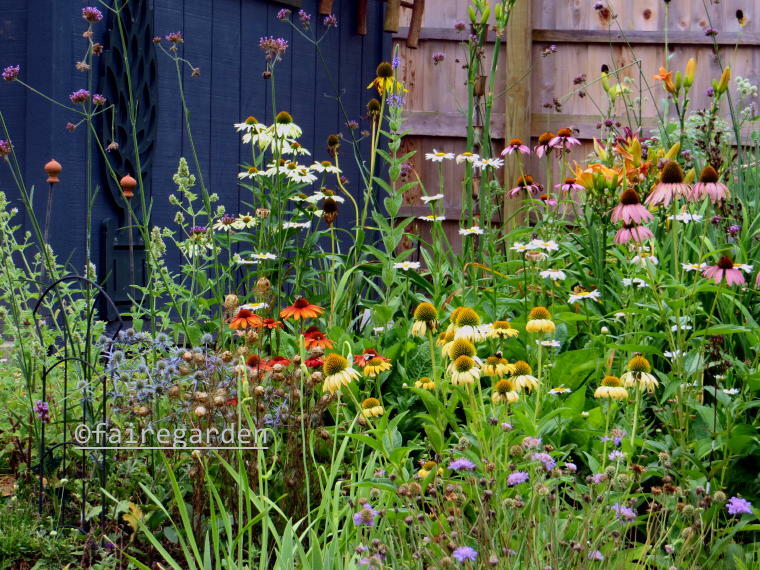 It is a little less wild and unruly, more like a garden and less like an unmown lawn which is exactly how the side bed between the houses began. That is correct. The Financier was gently persuaded to allow a wide section of what had been cut grass (mostly weeds, CRABGRASS) to grow undisturbed. Perennials were added as they became available and cornflower seeds were sown last fall to help fill in the space more quickly. 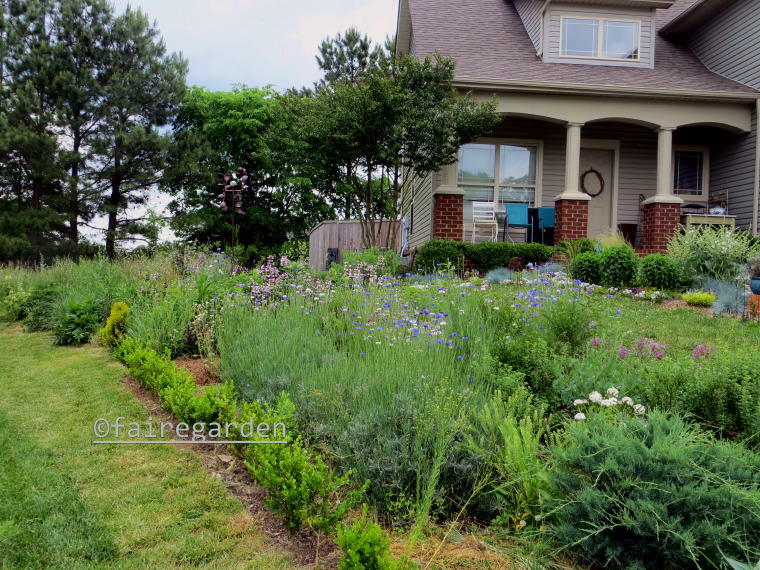 A strip of boxwood hedge on the front portion of the property line added definition and a row of lavender in front of the boxwood added pizzazz. This is what it looked like a year ago, from a slightly different vantage point. Look for the pale lavender of the Allium christophii on the far right side in the present day shot above this one for reference. Everything else is so large, the Allium is dwarfed now. The lavender has grown much larger than expected. The boxwood is just a row of sticks, barely visible as darker green wands behind it. The fenced back gardens have shown improvement, as well. The image above was taken last May, a year ago. 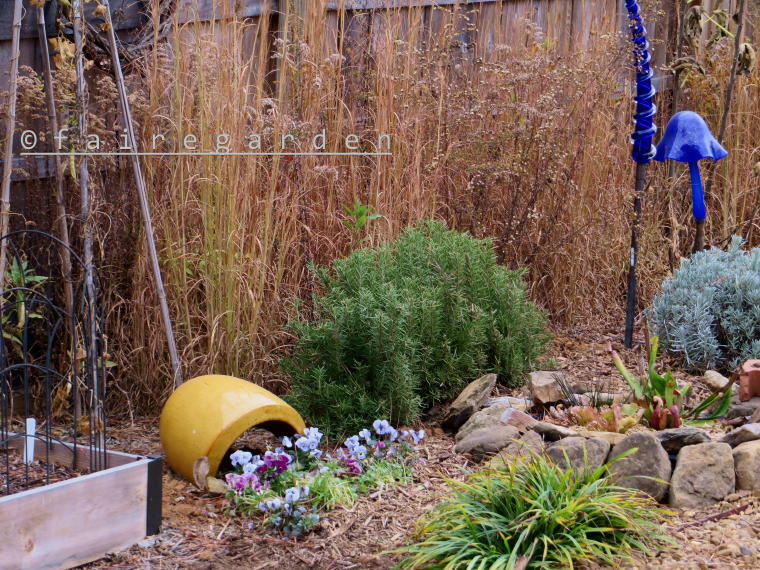 Garden art and containers were set willy nilly and sugar snap peas were grown on bamboo teepees. When the time was right, meaning when I felt like it, cardboard and mulch were laid over the closely mown lawn after the art and containers were relocated. Again. I have entirely too much art and too many containers. Many and much were left behind at the old house, too! 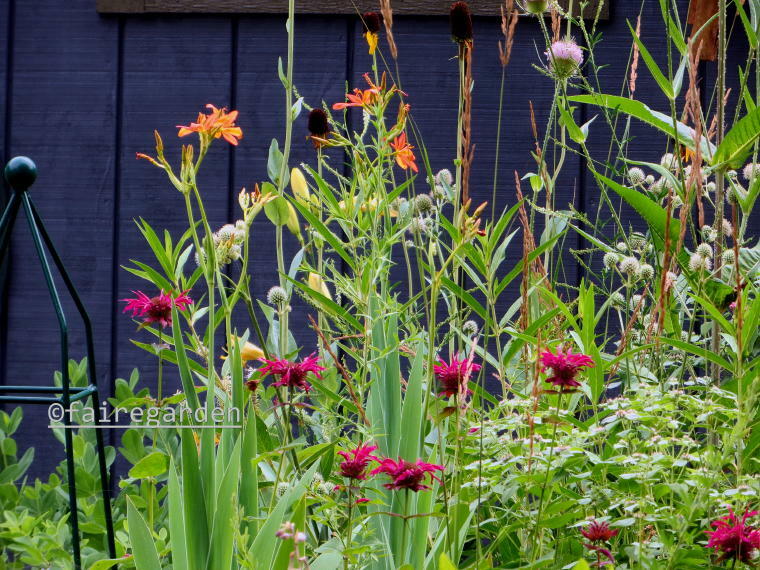 More lavender, more fall seeded cornflowers and a young Rosa ‘Veilchenblau’ are helping the south facing fence resemble the beginning of a respectable garden. That rose is one that was grown first in my Texas garden and again on the shed at the old garden. The photo below shows it in full May glory in 2011. 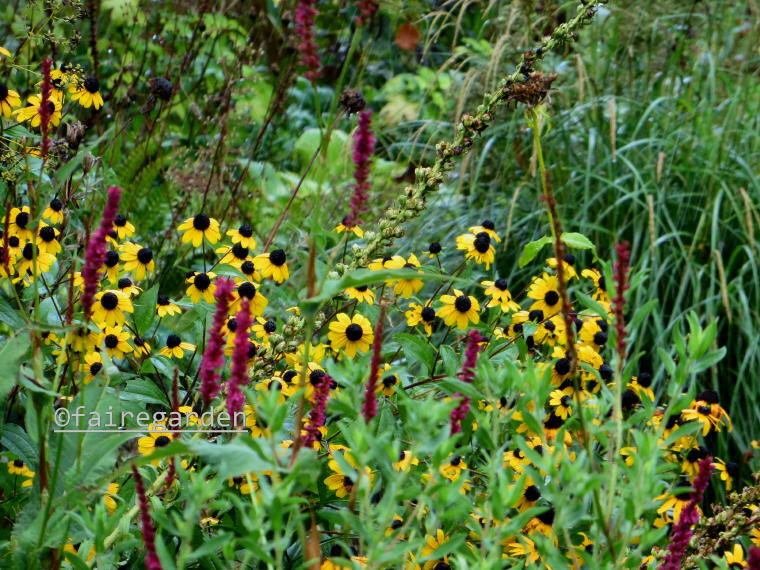 While only a once bloomer, I adore the prolific, dark flowers. It helps to give a sense of continuity to my gardening life. May the new Veilchenblau grow to match that same abundance. I feel confident that it will. The opposite fence is where the garden began. After we closed on this house but before we even moved in, a dump truckload of planting mix was delivered to form the nursery. All the potted and bagged plants from the old garden were stuck unceremoniously in there after it was spread out a bit. Another truckload was added that winter to form what is called the lower nursery. That bed is shady and more moist. These two beds are my pride and joy. Many a pleasant moment is spent sitting in the shade contemplating the gardens and making plans for improvements. Last year Geranium ‘Johnson’s Blue’ offered immediate impact and bloomed all season with the help of a couple of haircuts as blossoms faded. The current view reveals the growth and filling in that has taken place in one year’s time. 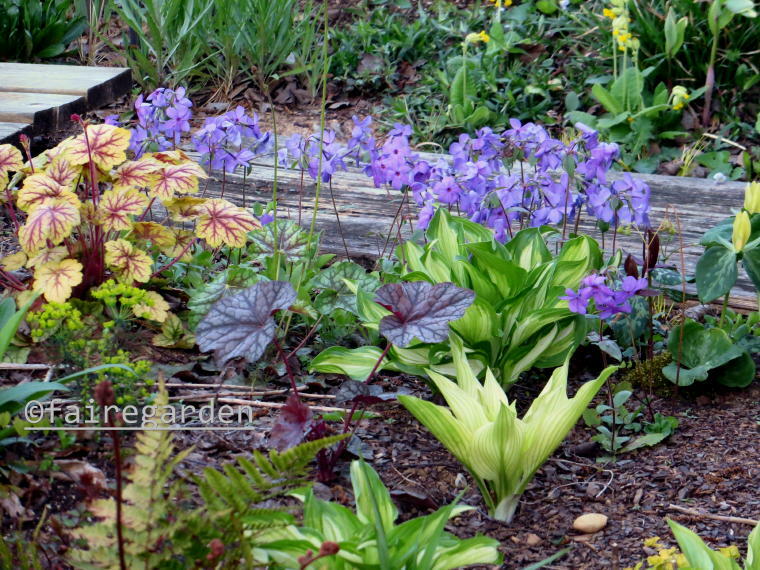 Johnson’s Blue has only just begun flowering, but there is plenty of visual interest with leaf form and color from the assorted Heucheras, Hostas, ferns and grasses. This photo is taken from the corner of the fence, where the above mentioned navel gazing often takes place in comfortable chairs. It is shady, cool and not too breezy as to be a bother during the languid summer months. The shed is an anchor to the changing seasons as the years roll by. Zooming in always gives a more pleasing capture. 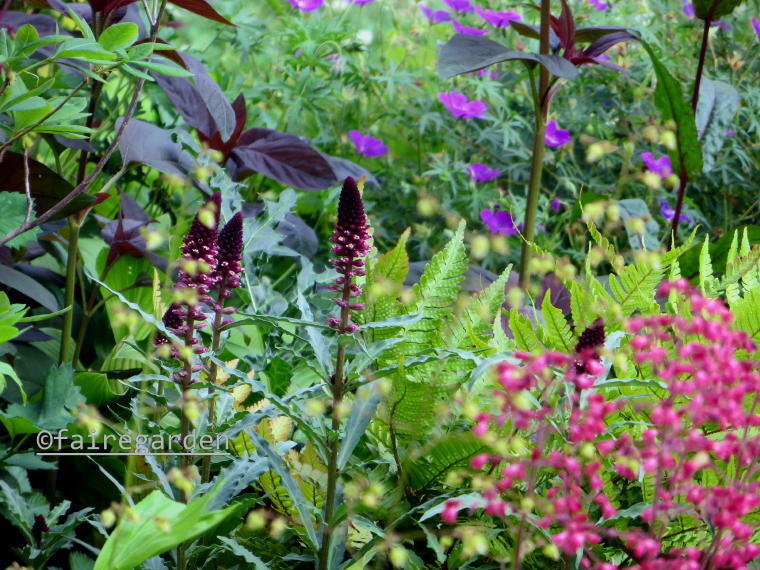 It can showcase small treasures that might be missed in the long shot, like the dark red blooms of Lysimachia atropurpurea. But I also wanted to share what my eye sees, the real warts and all view. There has been toil and treasure expended to create a new garden here, starting from scratch. So far, so good. 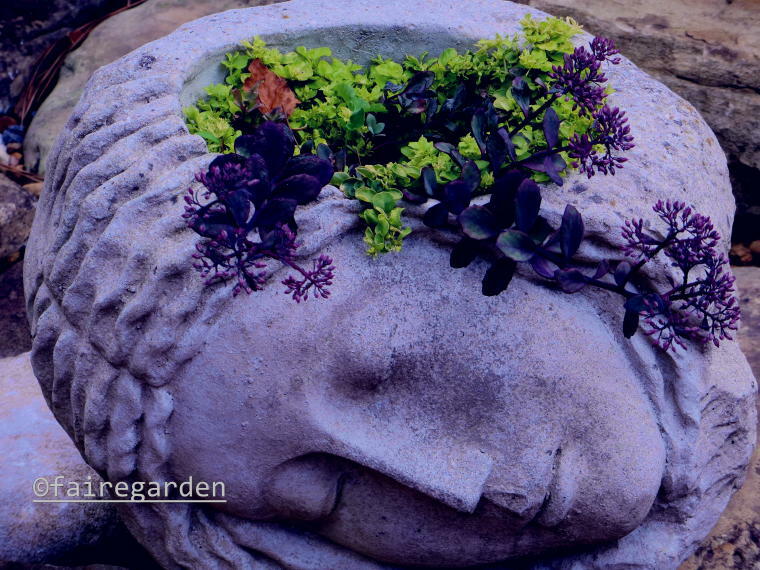 May the garden continue to progress as long as the gardener can still draw a breath. Onward. It has been started from scratch, this new garden. There was nothing but a crabgrass lawn and overgrown foundation plantings when we took possession of the new house in August of 2014. Lots of work has been done and plenty of treasure expended, both physical and monetary. It, the garden, is beginning to reward us for the effort. 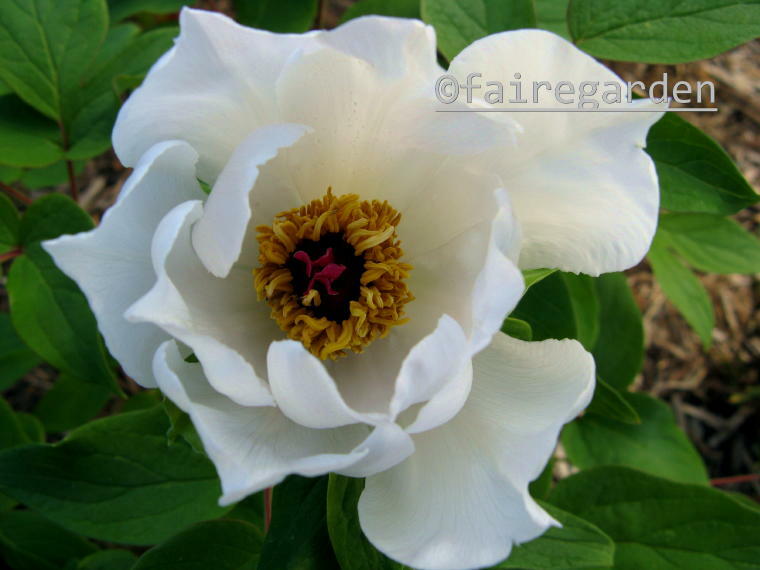 Our favorite plants were brought here, some notorious for not wishing to be moved, like the first tree peony we ever planted anywhere, P. ‘White Phoenix’. It was written about and photographed many times in the old garden. This is its maiden voyage here. A very small root section was dug and potted a year before the big migration to Knoxville. The leaves were scraggly and heat burnt by the time it was planted in what was to become the Japanese Garden. The cork was popped on the prosecco when the little stick sprouted leaves last spring. It can take years for such a tiny specimen to flower, but since we held our mouths at just the right angle and made copious prayers to the powers above, a single bloom graced 2016. Panning out, the small white flower ball can be seen at the back right fence corner, just under the reddish new foliage of the Japanese maple. 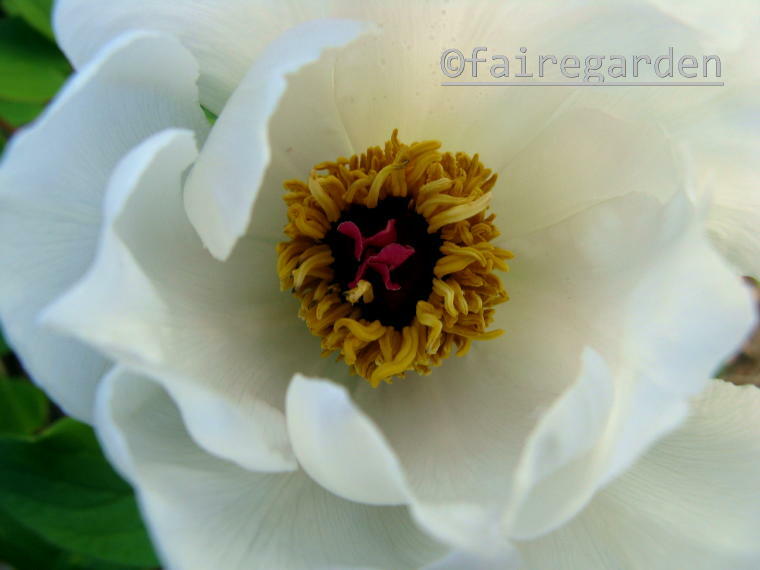 The camera shots of the first three images are not really lying, they just are showing White Phoenix at its best, pollen intact and petals shyly revealing their delights to any passing pollinators. Someday it will be magnificent. The long shot showing the Japanese Garden that is framed by fence and the protuberance that is the breakfast area of the kitchen also reveals the planting just under the arched window. This is mostly shady and was determined to be the perfect home for snowdrops, seedlings of a dark flowered Hellebore and Hydrangea arborescens ‘Annabelle’. There are two downspouts that help to moisturize the soil on either side of the large window, all the better to water you, my dears. 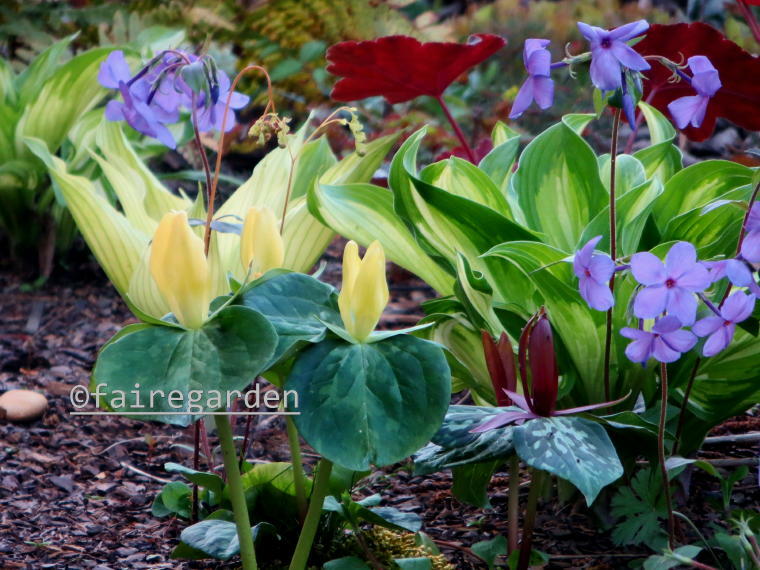 Forget me nots, Epimedium ‘Sulphureum’ and the spreading Euphorbia cyparissias ‘Fens Ruby’ help distract from the fading foliage of the various snowdrops, Galanthus ssp. Next to the kitchen window bump out is the back deck. It may be redone at some future date so plantings around it are not permanent, the perfect spot to grow some food! 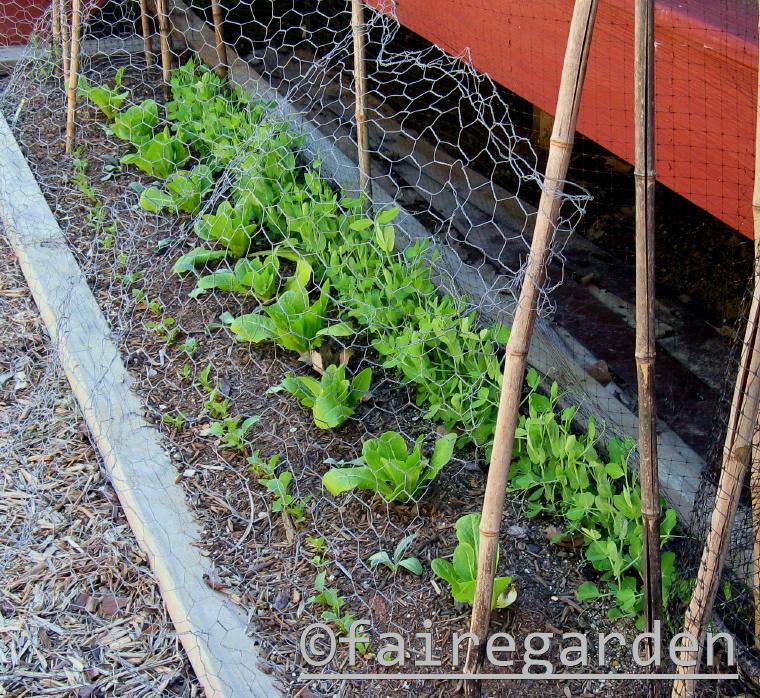 Sugar snap peas, lettuce, radishes and newly stuck in artichoke seedlings are protected from marauding birds and naughty cats by chicken wire until the veggies get more size to them. 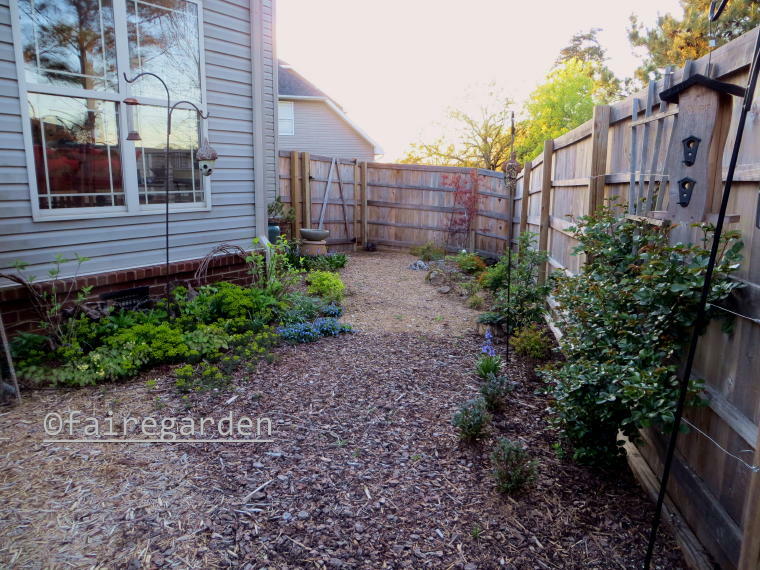 Moving out into the triangular shaped back yard, along the south facing fence are a few bulbs. Cardboard and mulch were applied last summer to try and tame the crabgrass mixed with the creeping devil bermuda grass. 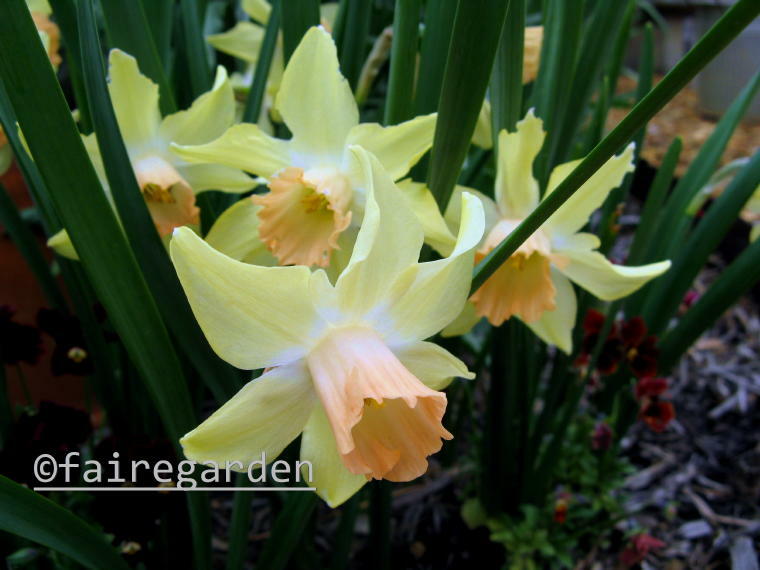 The pretty little daffodil, Narcissus ‘Prototype’ is on its second year of bloom. A handful of Tulipa viridiflora ‘Spring Green’ were tossed into a hole last fall. 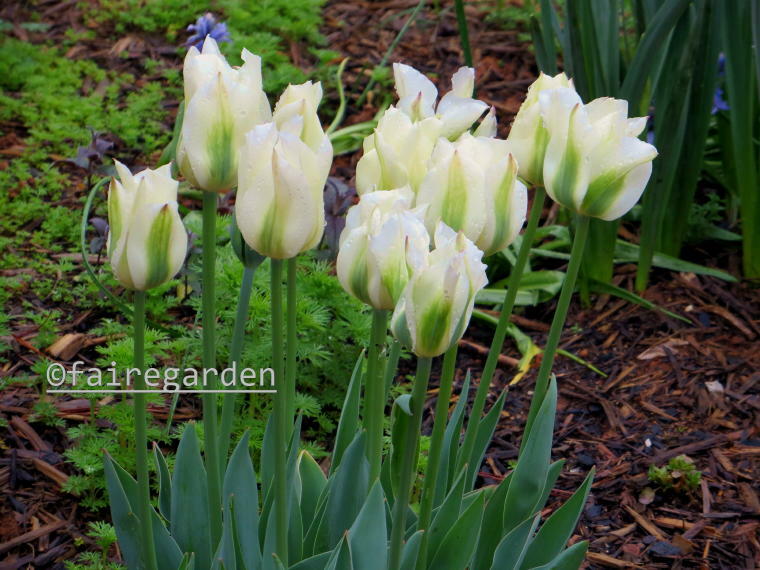 This variety of tulip was my favorite in the old garden, returning faithfully in the Knot Garden. Click here to see that vision of white. If these prove to be perennial here, more will be added. Tulips are considered annuals here, never blooming again like the first spring after fall planting. We shall see how it plays out. 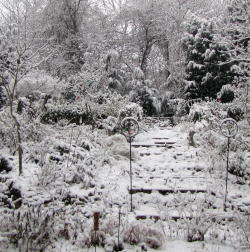 Across the yard are the two main garden beds, so called the upper nursery and lower nursery. 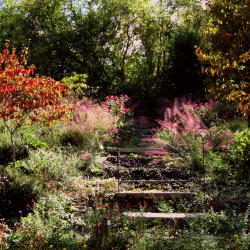 A walkway was made between them using three extra bench tops plopped across the muddy path that connected the two mountains of planting mix/topsoil brought in by dump trucks. 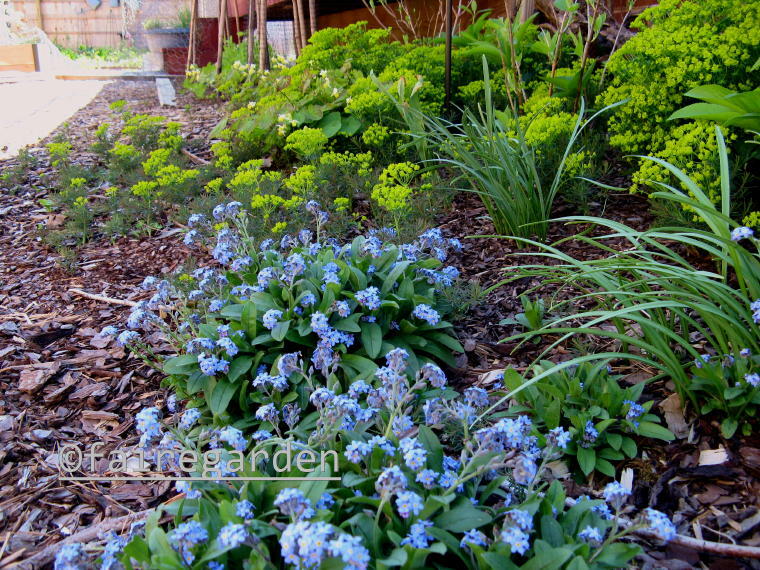 Both beds are fronted with small boxwood hedges rimmed with Muscari ‘Valerie Finnis’. The lower nursery hedge, which is more shady and wetter has Ajuga ‘Chocolate Chip’ mixed in, as well. Sometimes, make that always, the camera has a mind of its own as to what exactly I am trying to take a photo of. This shot got it right. Native deciduous azalea Rhododendron ‘Admiral Semmes’ luckily found at a Lowe’s in Asheville, North Carolina is in full bloom. 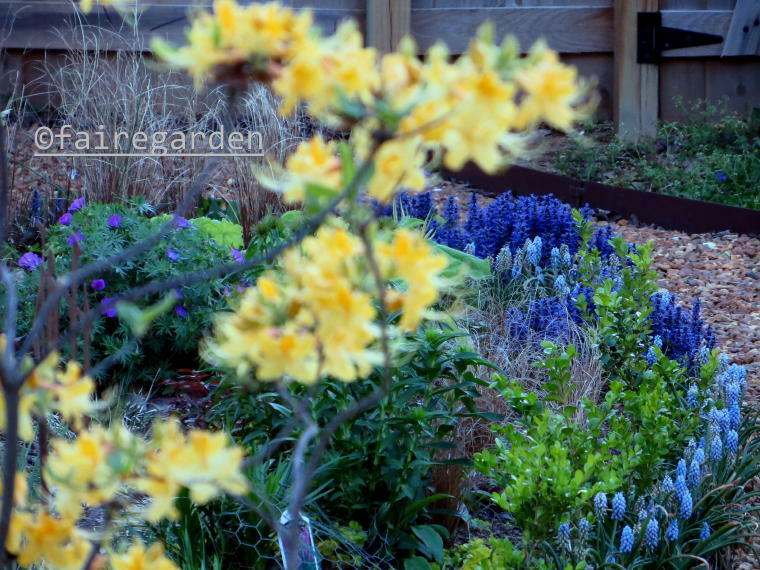 One of two shrubs on either side of the metal edged gravel pathways that lead to the shed are citadels of golden welcome in early April. Let’s have a look at the lower nursery now, a riot of spring if ever there was one. 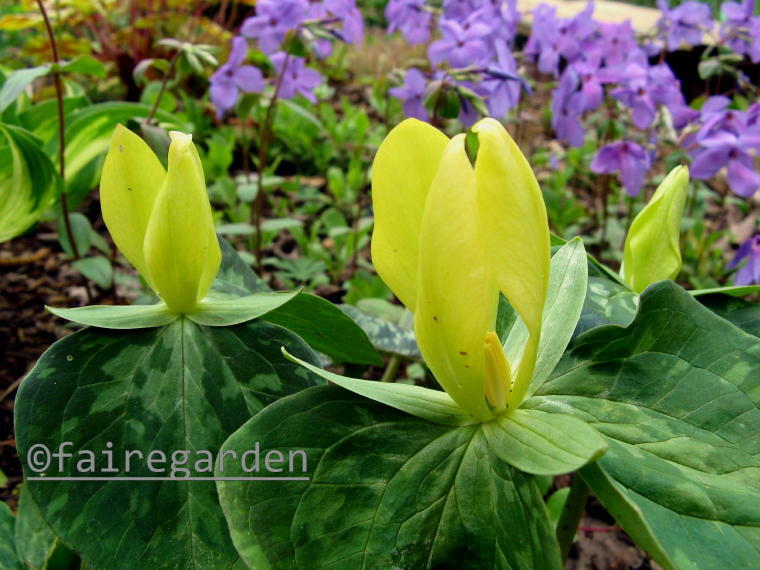 Trillium luteum, dug, potted and brought to the new garden has settled in nicely in the shady moistness. Behind is a newly purchased last year spreading Phlox stolonifera ‘Sherwood Purple’. 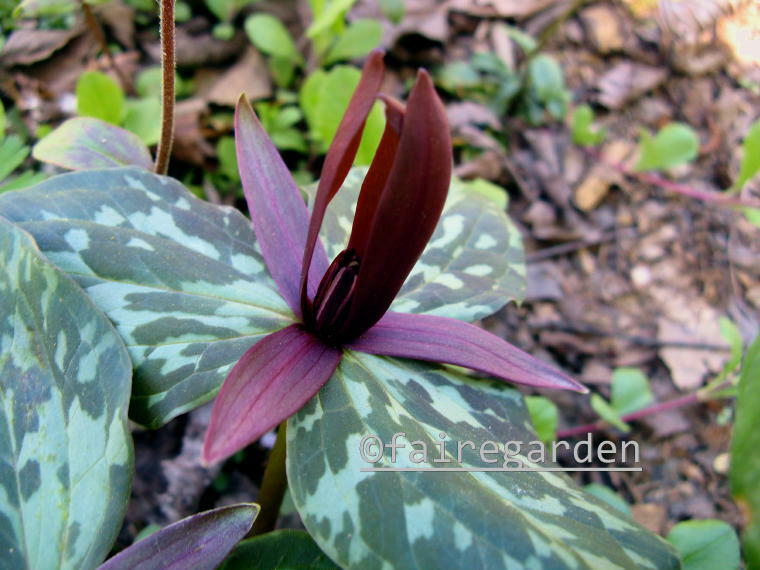 Trillium cuneatum, sweet Betsy, is showing itself. All the Trilliums were stuck into one pot for the move and I am not sure who all survived. We will celebrate those who made it and mourn the loss of those who did not. …a chaotic, colorful graffiti gone wild miasma of fun and frolic. The view from the other end, the haphazard and hazardous walkway needs to be tweaked before someone, me, gets a board in the face as these bench tops are not anchored and starting to come apart. If you step on the edge the opposite end lifts up. Note to self….put this on the to do list. It is a pleasure to see the woodland plantings from the old garden settle in so well here. There was actually no moist ground there as the whole yard was on a steeply sloping hill all the way to the street. It’s a wonder these plants grew there at all. They are happier here, it seems, so far. 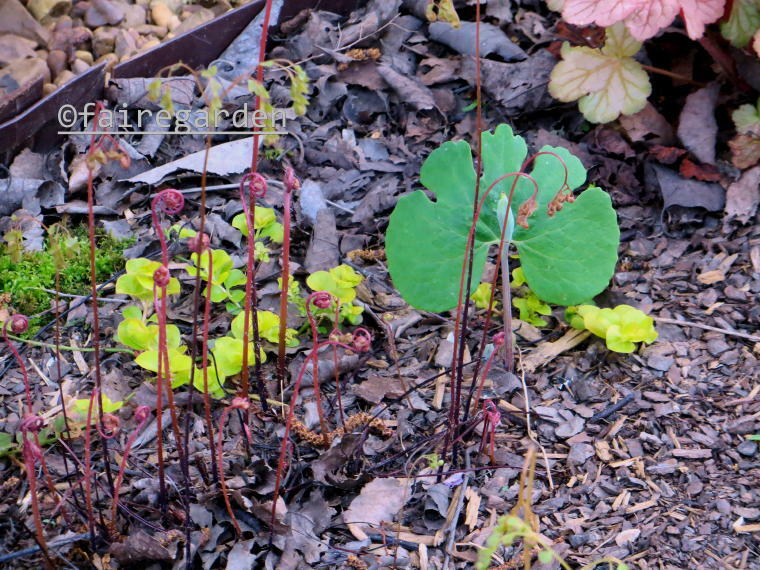 I like the bloodroot, Sanguinaria canadensis leaf curtain behind the seed pod and hope for some seedlings to appear in the future. To finish up this overly long and image heavy post, I really must post more often, we bring you Xena. 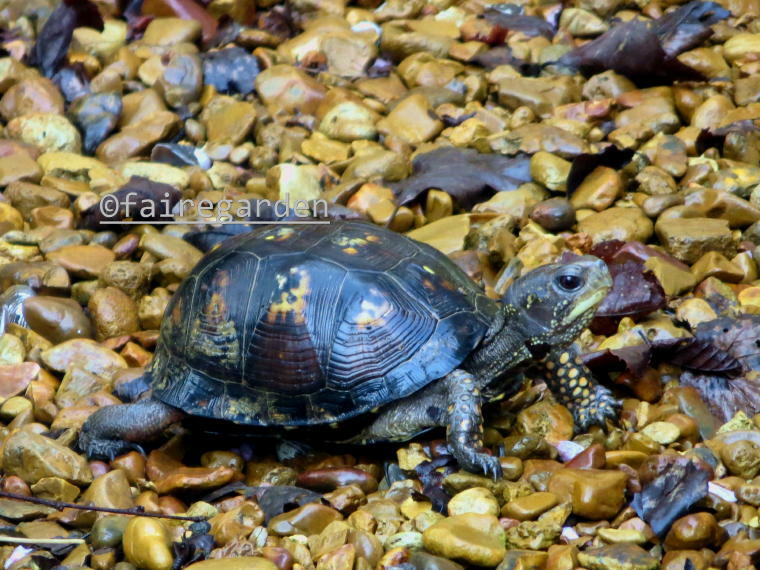 She is a young female Eastern box turtle who showed up last fall and then disappeared into the brush pile. We had a nice family of these turtles at the old garden which can be viewed by clicking here. Awake from hibernation and looking for adventure, she will lead the way with her bravery. Onward. It is truly winter now. 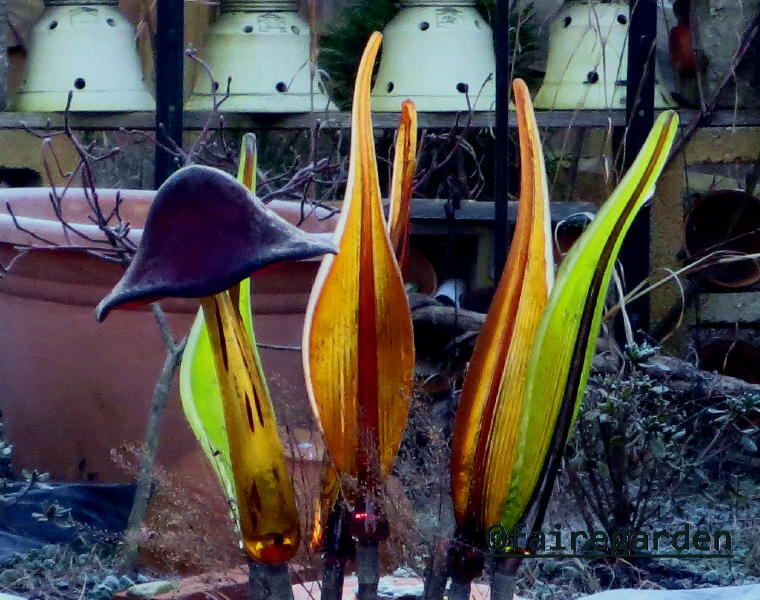 The weather remained mild for longer than usual this season and the plants appreciated the respite from killing cold coming after the holidays rather than before. 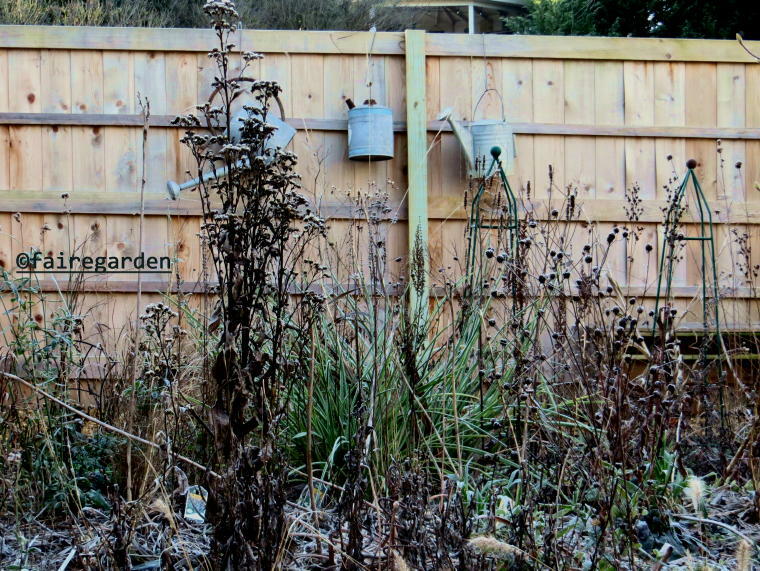 Leaves were still attached to some deciduous denizens but after several shocks of below freezing temps the garden now looks January appropriate. 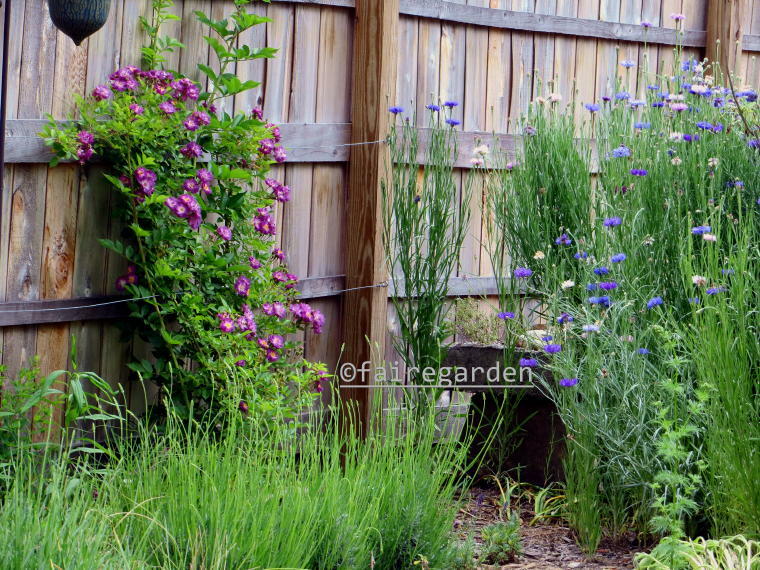 Along the south facing cedar fence clusters of lavender and rosemary carry on bravely. In making this bed, the naturally occurring little bluestem was left uncovered by the thick sheets of cardboard covered with mulch that was used to suppress the wily crabgrass. 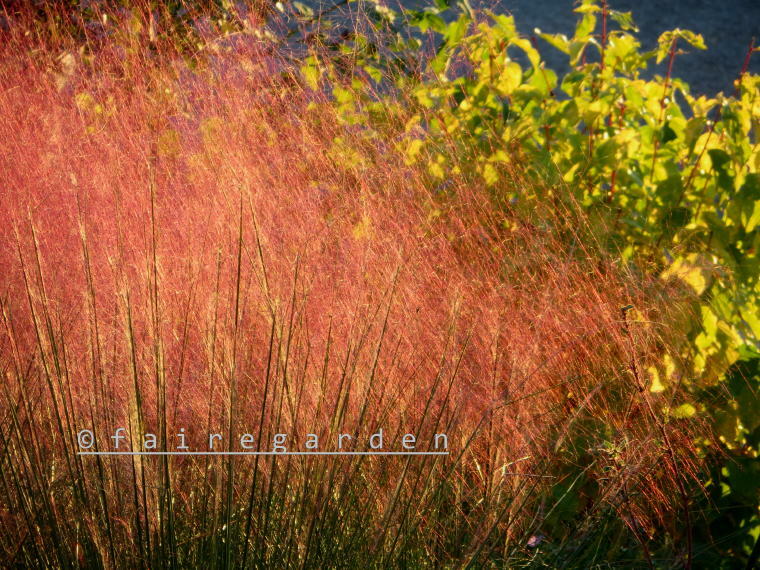 The tawny grasses catch the morning light and offer movement and color during these bleak months. 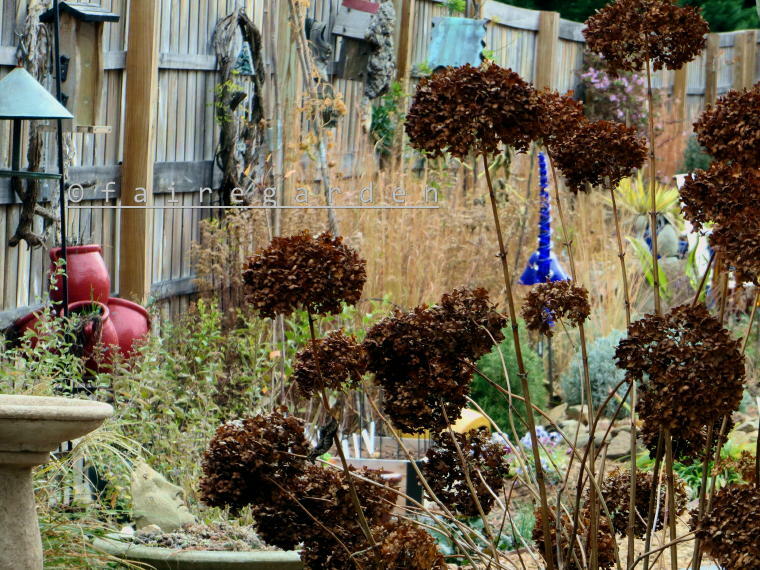 Along the opposite north facing fence, the collection of metal watering cans hangs from hooks. 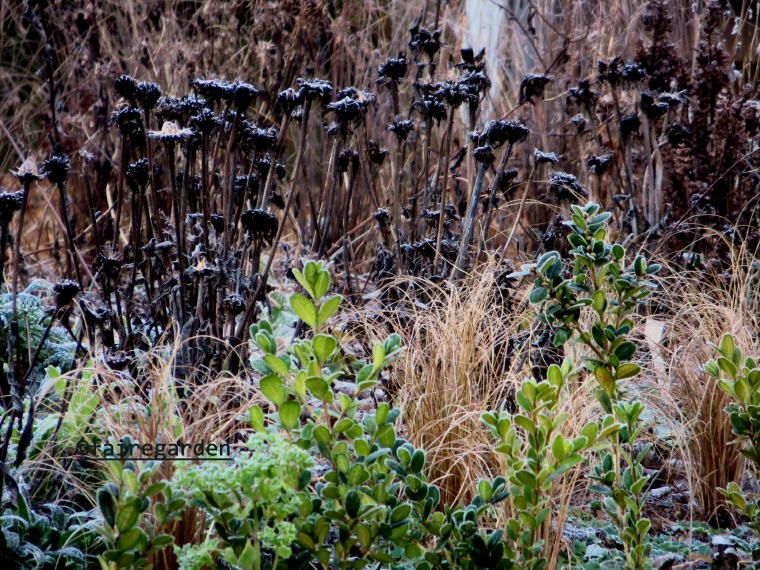 The perennials have been left standing to make note of which among them has their winter game on. 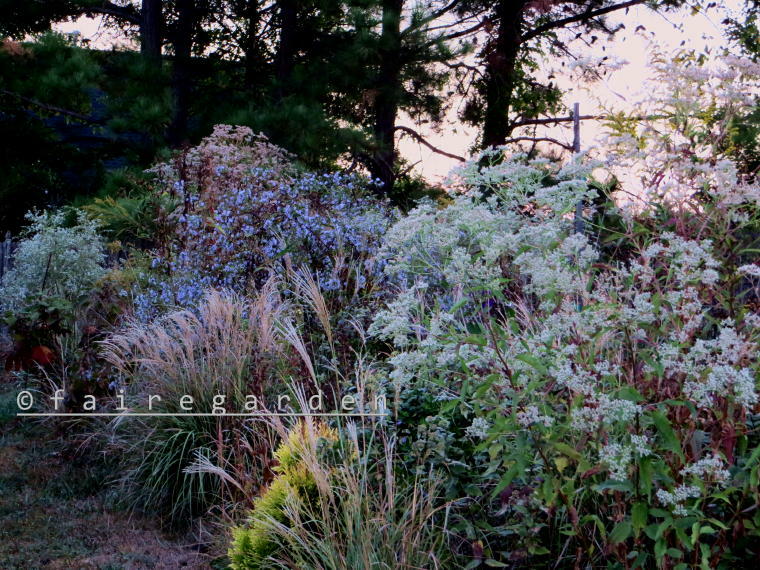 In the foreground, Aster tataricus ‘Jin Dai’ presents an imposing vertical accent. Pieces of Jin Dai were spread in the area this summer so next winter should see an even more impressive winter statement. Lesser blobs of Rudbeckias, Penstemons and Verbenas add some thickness, but the daylilies are like straw colored melted snowmen. They should be benched, er, cut back in the fall once the frost reduces their turgidity. The green spikes are Eryngium pandanifolium, pushing our USDA Zone 7a envelope. No blooming on those as yet, but they did make it through a harsh and wet winter in 2014/2015. 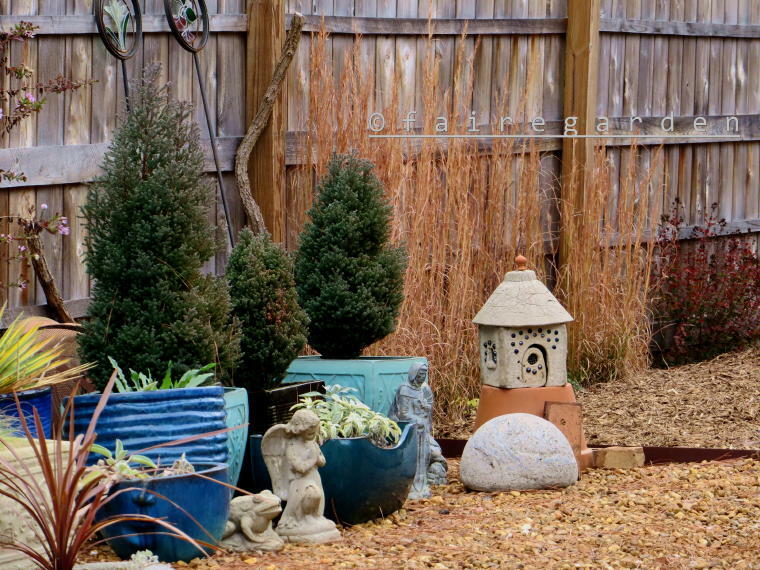 Evergreens are stalwart winter interest performers and boxwood is a favorite of mine. These small specimens will be kept short, possible pruned as a low hedge or perhaps kept as rounded separate balls of greenery. These are Buxus ‘Wintergreen’ and do hold true to their name. 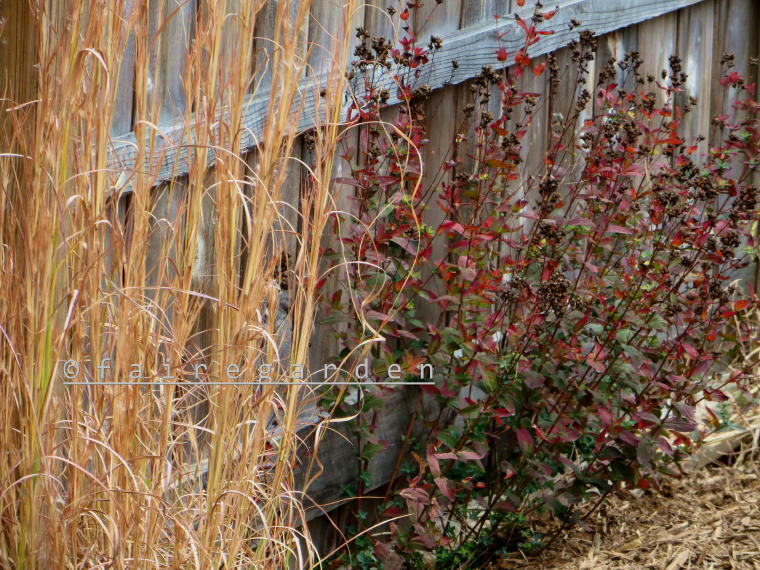 Carex testacea gives a good contrast of color, texture and form along the edge of the upper nursery bed. It is hoped that they can hold up unscathed to the ice, snow and cold of the long nights ahead. The supine sea creature foliage of Musacari ‘Valerie Finnis’ adds embellishment now with the promise of pale blue flowers come March. In the lower nursery bed which is more shady and more moist than the upper portion, there is another row of the same boxwood. 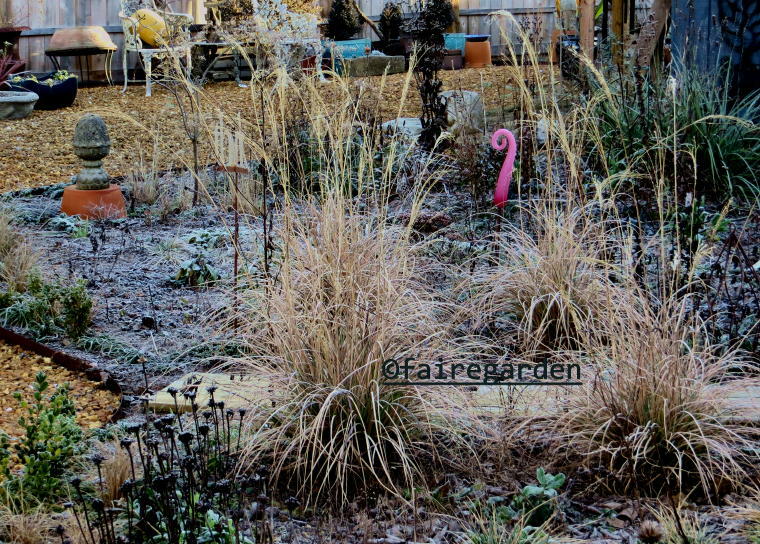 Carex buchanii ribbons behind with a grouping of Echinacea ‘Green Jewel’ still standing proudly erect. 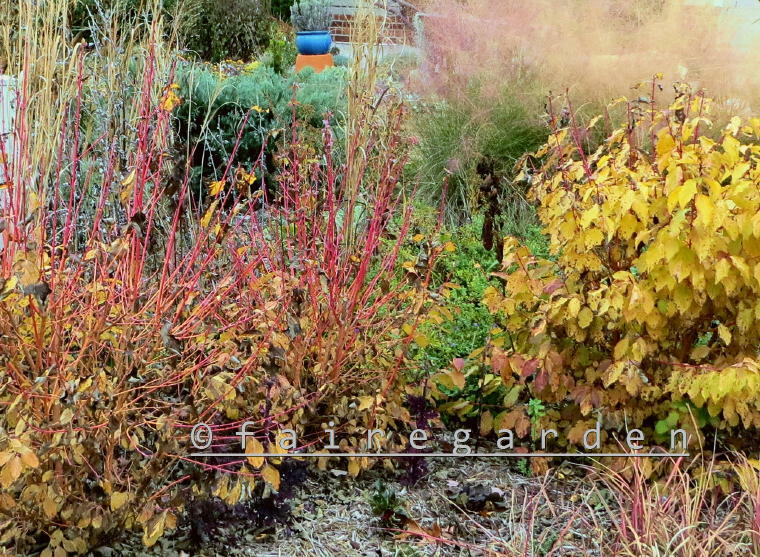 The dark stems and seedheads contrast with the beige miasma of grasses and various perennial foliage in the center of the bed. I like it. 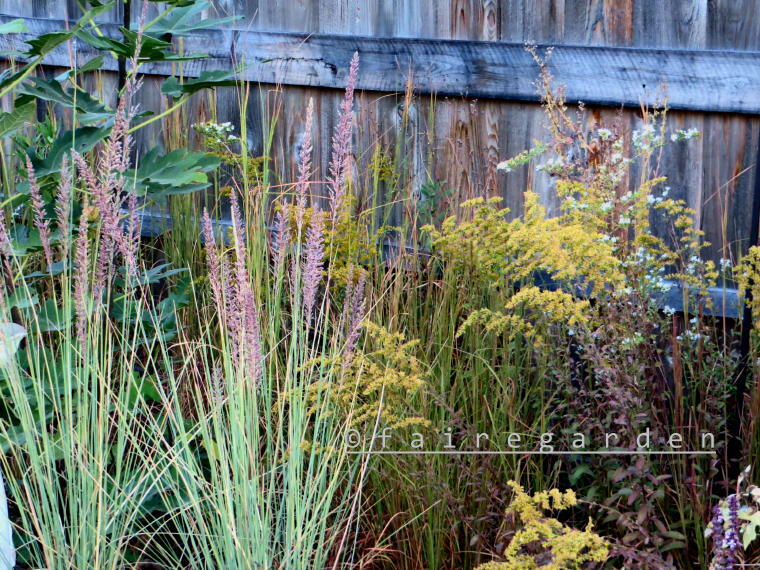 Miscanthus ‘Adagio’ blends well with neighbors, particularly the shapely Veronicastrum virginicum. We have high expecations that this combination will prove to be superstars of not only winter interest but for most of the year. Stepping back for the long view, we can see the upper nursery and leading edge of the lower nursery plantings of four Miscanthus ‘Adagio’, two on each side of the dividing boardwalk. Strong presence is what was needed here and this grass fits the job description. Many more of this cultivar are in use in the front lawn/meadow planting between our yard and the next door neighbors. These were purchased last year in three gallon containers, each sawed into four bits for easier planting and frugality. The impact was minimal during the first cold season, but this year has seen them rise up and excel. The future looks bright as the years roll onward. 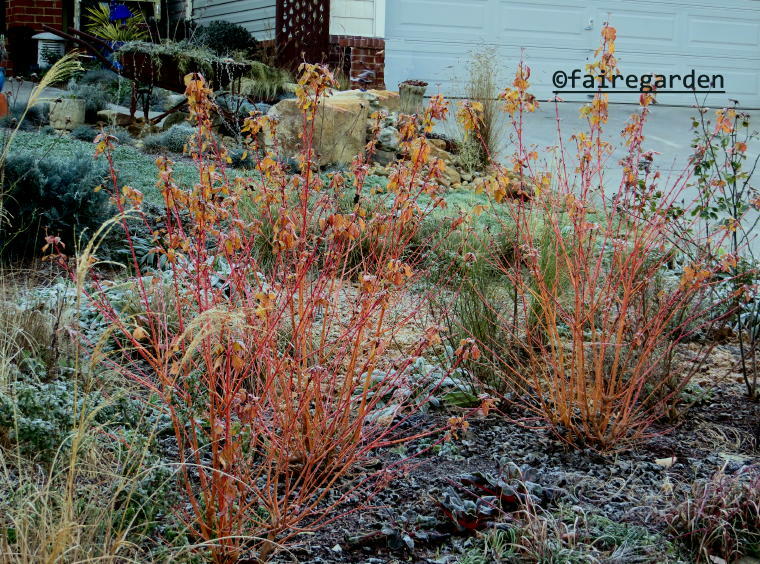 Moving to the front yard, the three Cornus ‘Midwinter Fire’ are attention grabbing in the mailbox bed. The suporting players still need some growth to gain girth to offer a better backdrop. 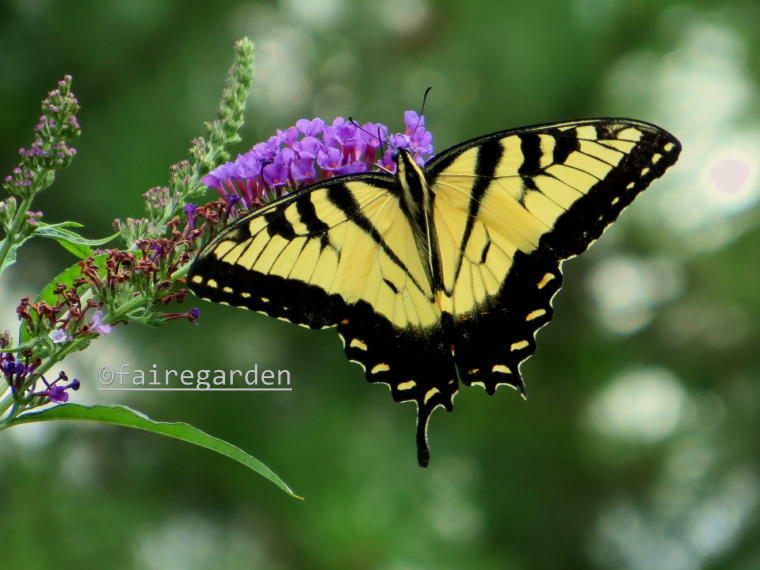 Patience is a great gardening virtue, never forget. A closer look shows the painterly colors of red, coral and gold on each stem. A few leaves at the tips echo the same hues. 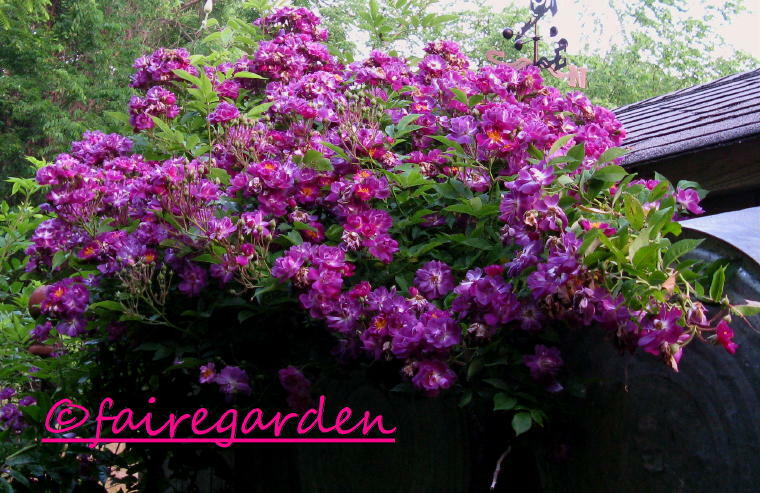 This is an outstanding winter interest shrub. 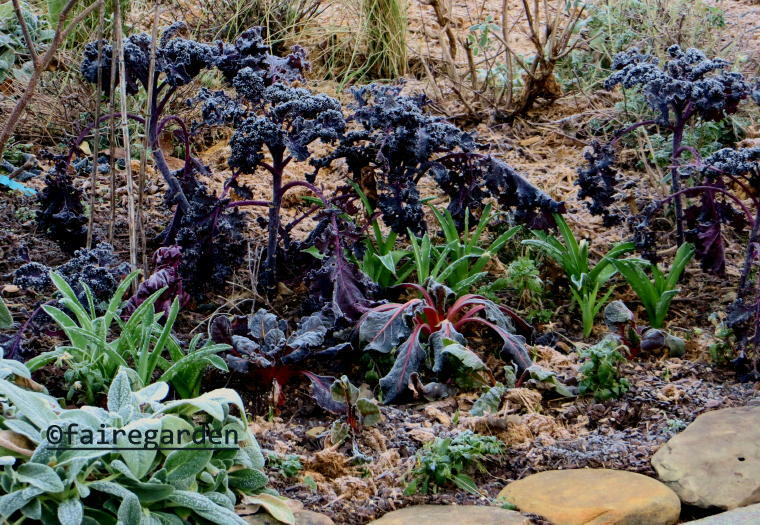 Redbor kale, grown from seed sown in September and eaten mercilessly by caterpillars offers a rich, velvety purple accent especially when frosted. It was surprising how much cold those hungry hordes of insect larvae could withstand. Luckily their bright green bodies were easy to detect against the dark leaves, once we noticed the holey leaves. 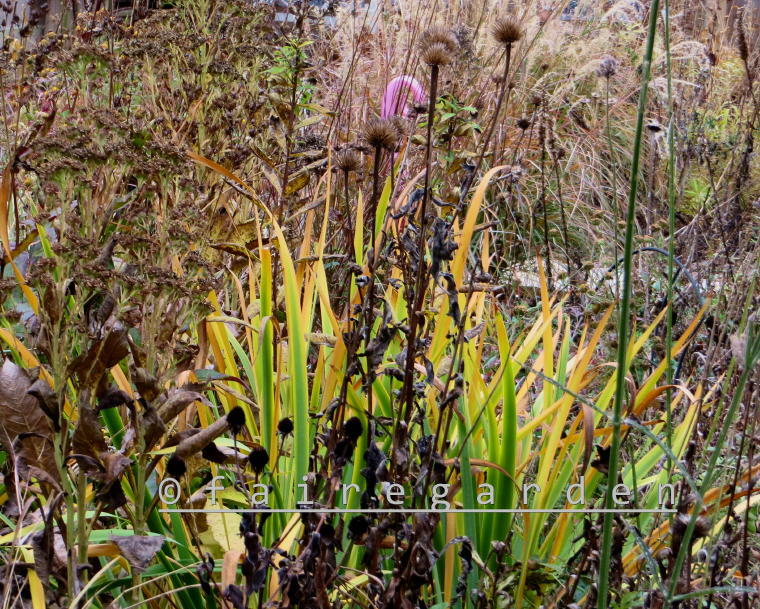 Allium schubertii foliage has erupted to an alarming height already. There may be some damage to the leaves before bloom time in May since we haven’t really been hit with the harshest conditions of winter yet. Hang in there, guys! Blue fescue, Festuca glauca is the matrix planting along the front walkway. 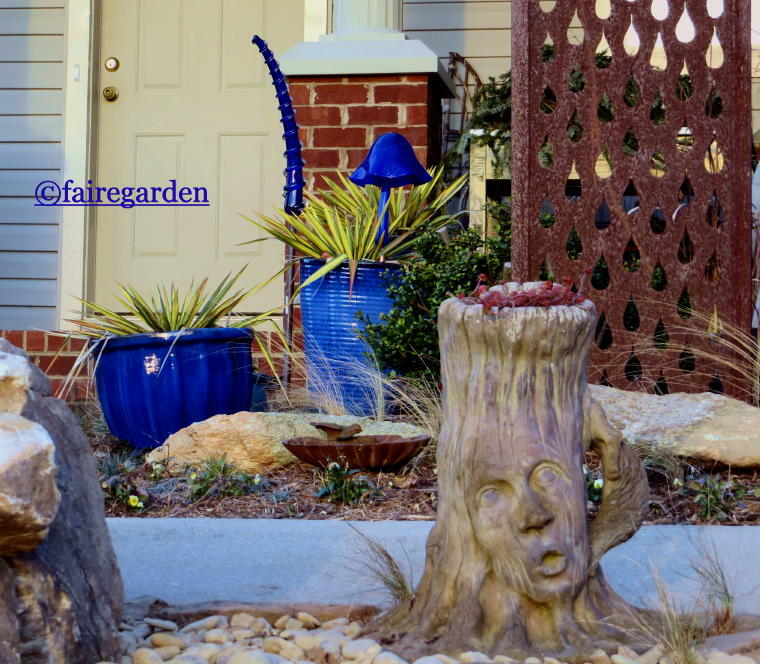 The desired look was for year-round uniformity, and I love the blue. Snow in summer, Cerastium tomentosum was chosen as an accent. 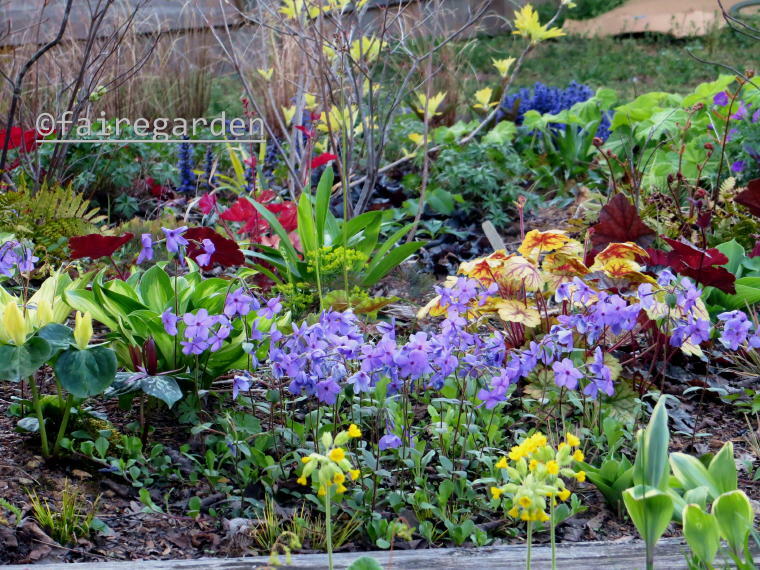 Violas and crocus are planted along the edge for color in late winter. 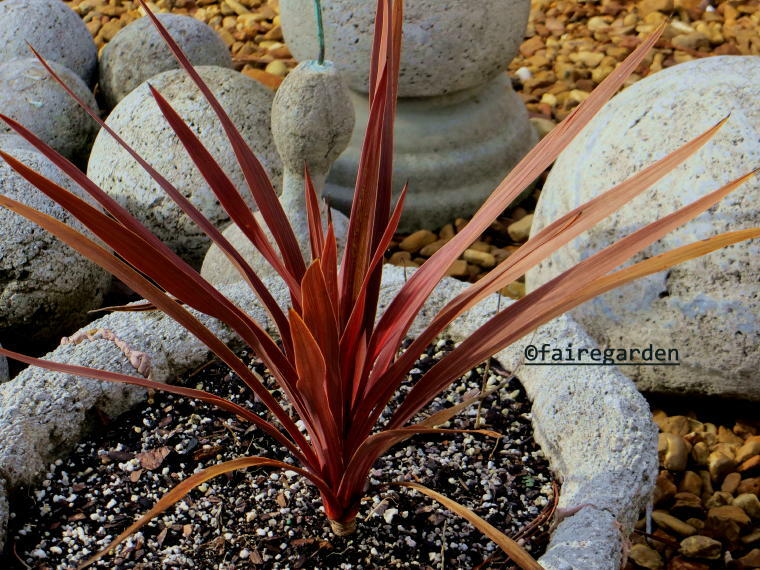 The red Phormium won’t last until spring without wilting down to mush, but it has done well and is such an architectural addition. More of that will be added next year. These leaves never let me down. Frosted or unadorned, they always come through, especially when backlit. They are from the wonderful glass artist, Barbara Sanderson. Her online shop can be found here. It is so nice to have a real garden again, even in the depths of the down time. 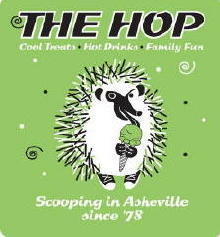 Winter interest is so important if you happen to live in a four season area like east Tennessee. Seldom is the yard buried in snow cover so what is left standing should offer a pleasing view from inside the house or when the weather permits outdoor perusing. We do love a good peruse.